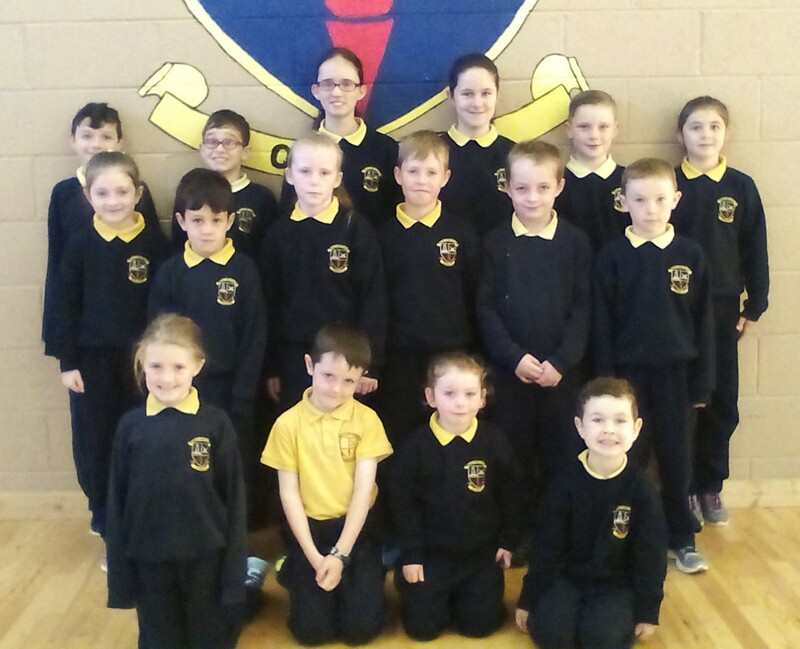 Christmas Concerts: our students from Senior Infants up to 2nd Class did themselves proud at our big Christmas concert. 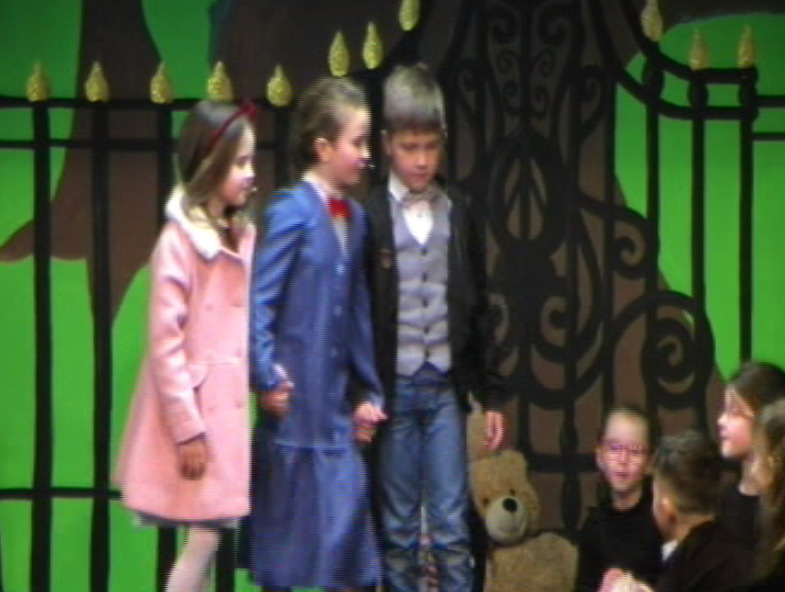 The children put on a great production of the classic film Mary Poppins. 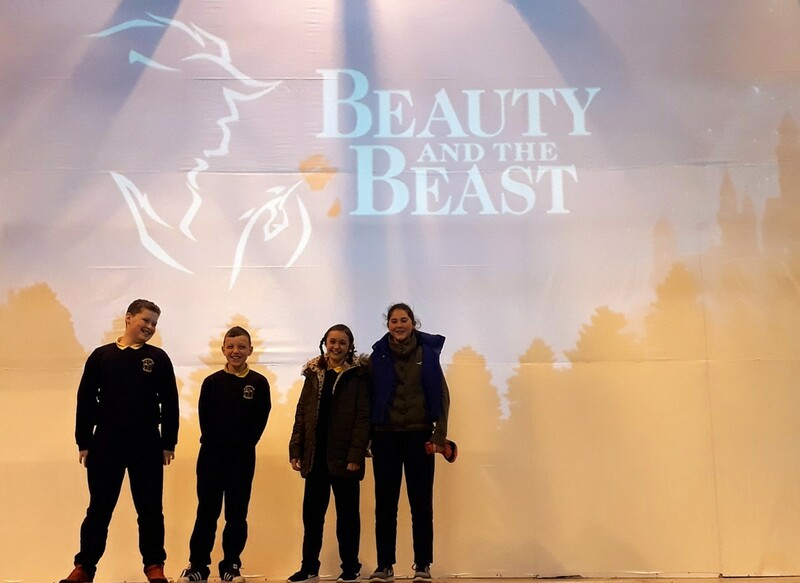 Our ‘producers’ Ms. McMahon and Ms. O’Connell were absolutely delighted with the effort put in by everyone and they are sure that we have a few future stars of stage and screen in the school! 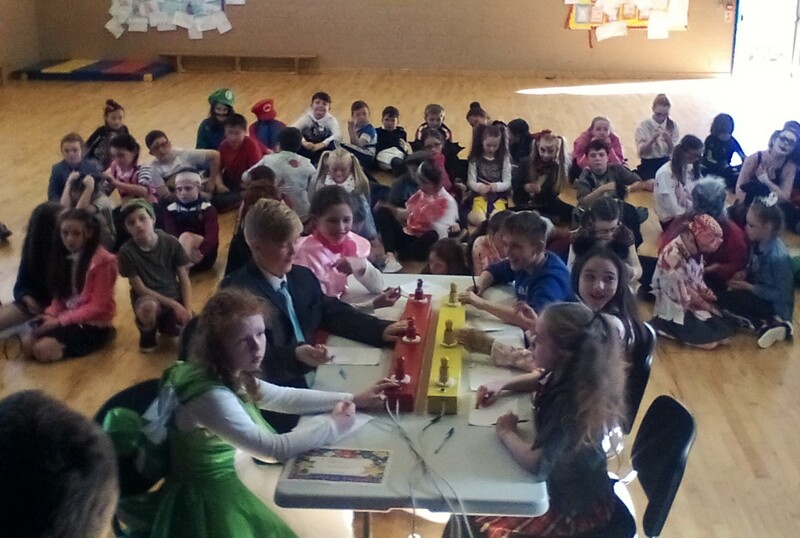 Thanks also to all the families and Corville community who came out and packed the hall for two nights, showing great support for the children throughout. 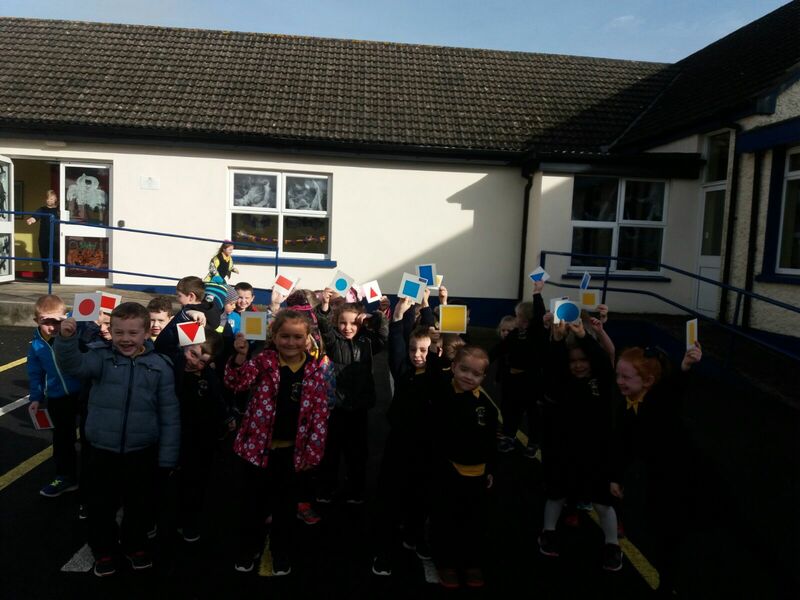 Our Junior Infants also put on their very own concert before Christmas. 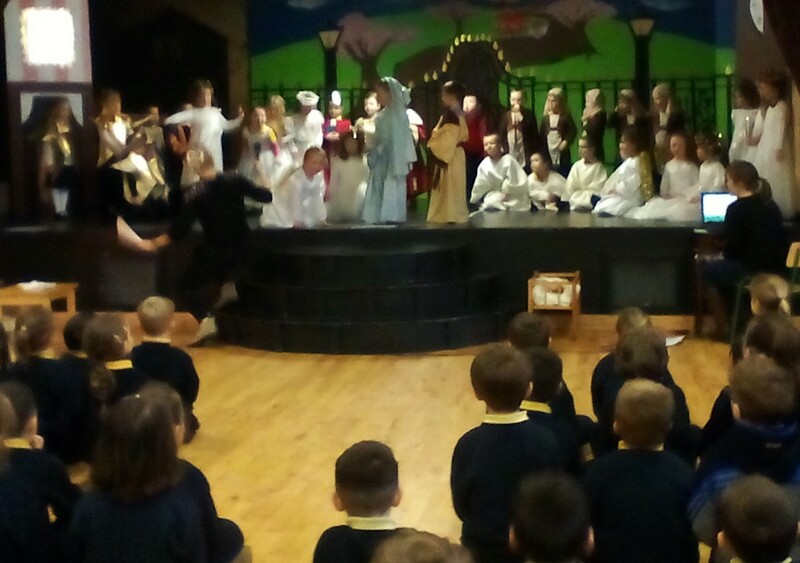 It wouldn’t be Christmas in Corville without The Nativity Play! 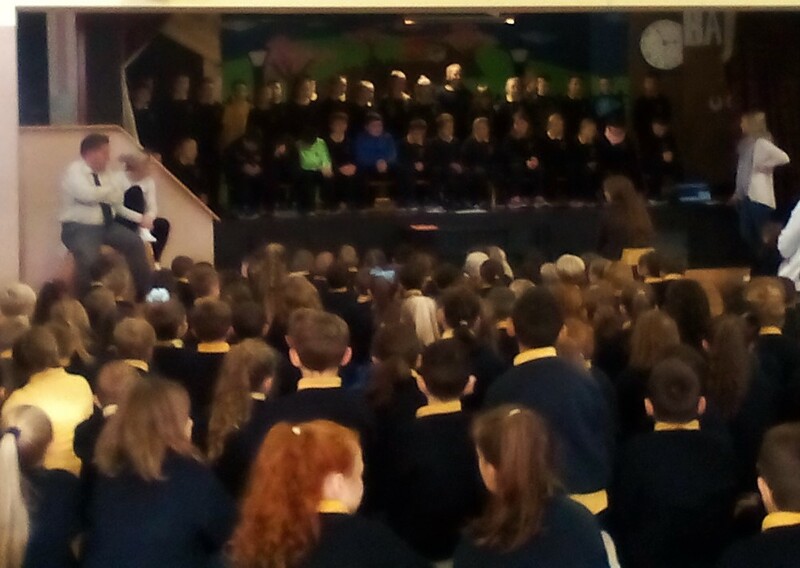 Junior Infants put on an excellent show for the school and their families. 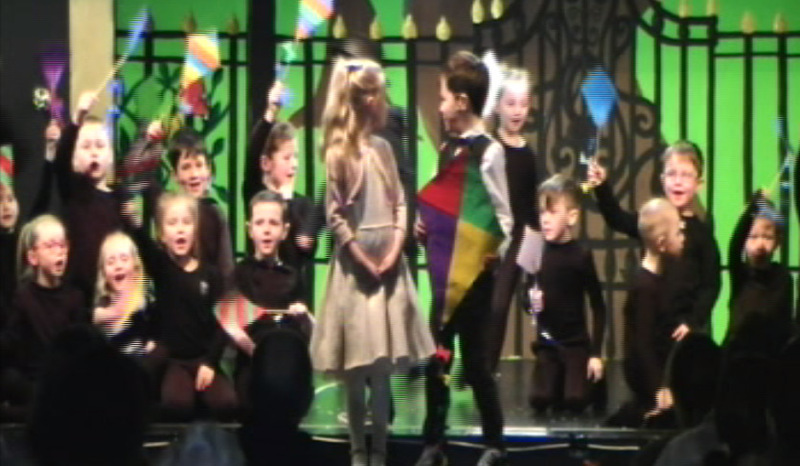 It’s great to see these young children showing the confidence to get up on stage and perform so well. Congrats to everyone involved. 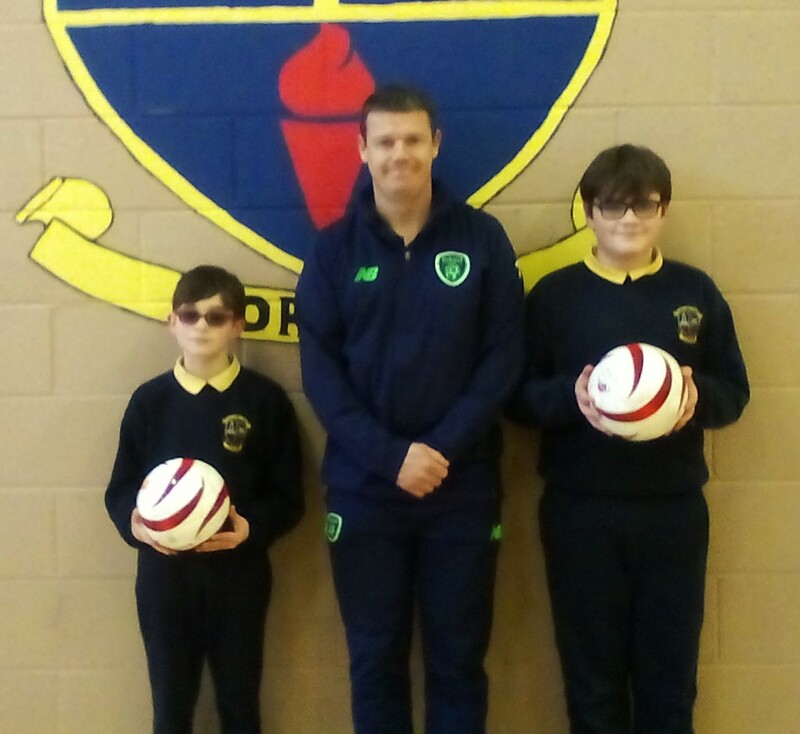 Visually Impaired Football: the school were delighted to welcome a representative from the FAI to the school to introduce our 5th and 6th classes to the sport of Visually Impaired Football. 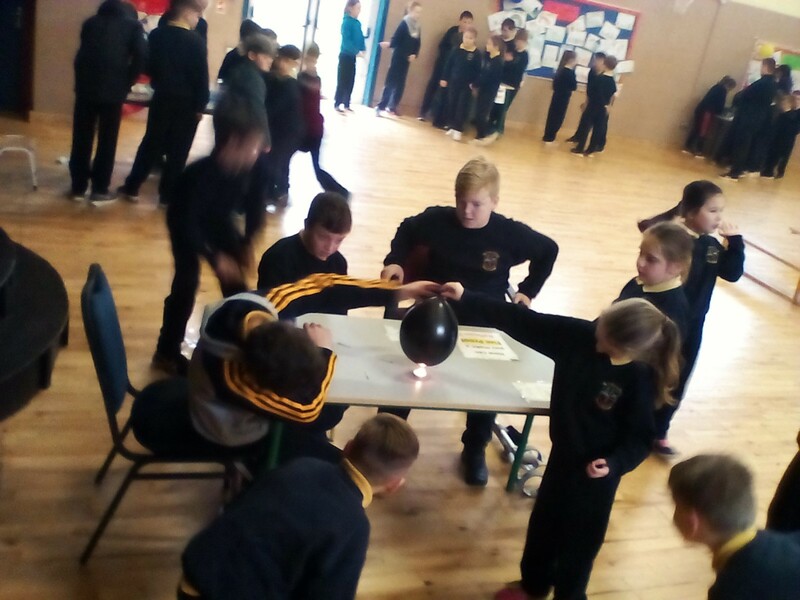 The students all donned their blindfolds and took part in games of soccer using a ball with ball bearings in it to allow the ball to make a noise and give the players the chance to know where the ball is. 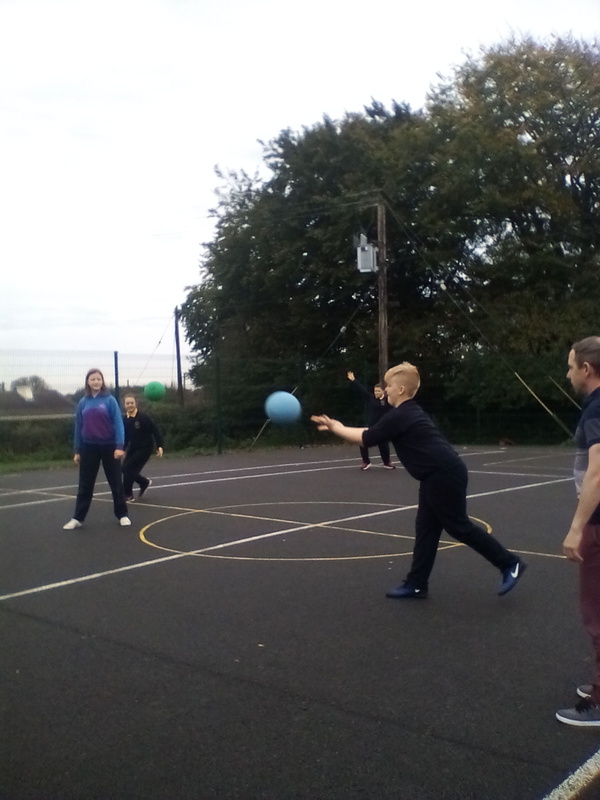 There was much amusement as the games were played; but it was also very illuminating showing the difficulties visually impaired experience. Bootcamp: in an effort to get fit and active again after Christmas, the school our putting some of our students through a bootcamp. 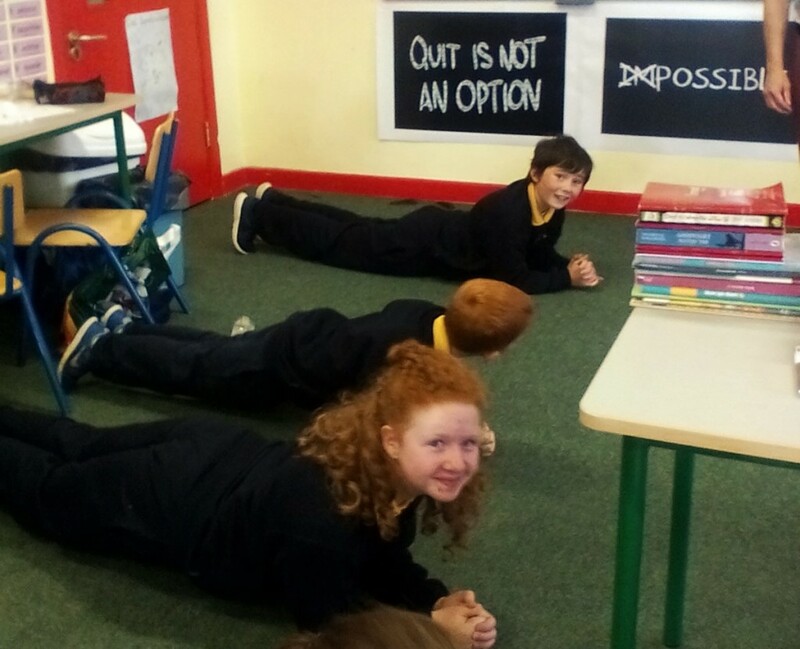 The session was tough but great fun and all the students were delighted to get a little break from class. The next morning there were a few funny walks from the students; clearly some leg muscles were worked hard the day before! Student Christmas Present Draw: before Christmas, we had our annual student Christmas present draw. Two student names from each class got picked from a hat and they got to go on stage and open their present. I have never seen wrapping paper being ripped open so quickly! 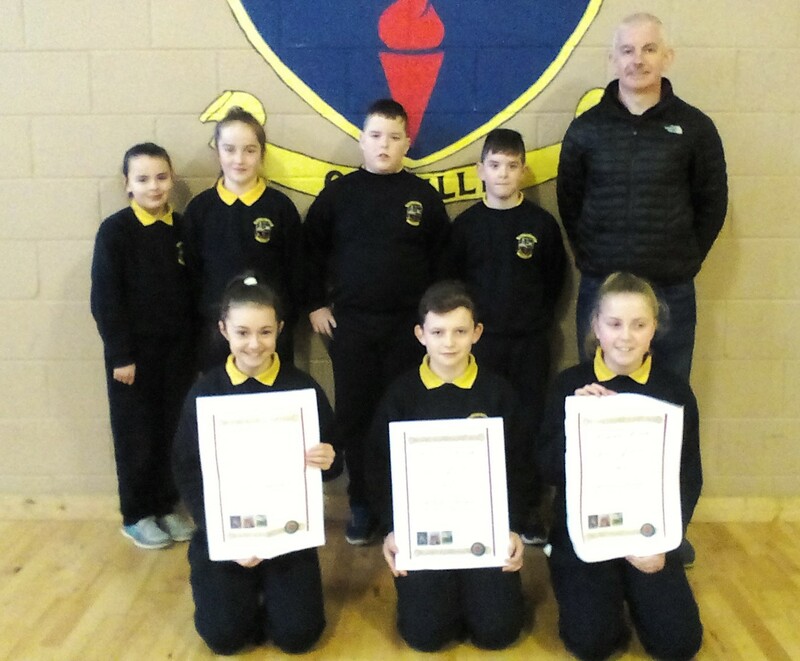 Roscrea People of the Year Awards: congrats to all our Corville students that were recognised for their great achievements last year winning the Community Games All Ireland Rugby and Soccer tournaments. It is fantastic to see you all getting the praise and recognition from the town that you deserve. 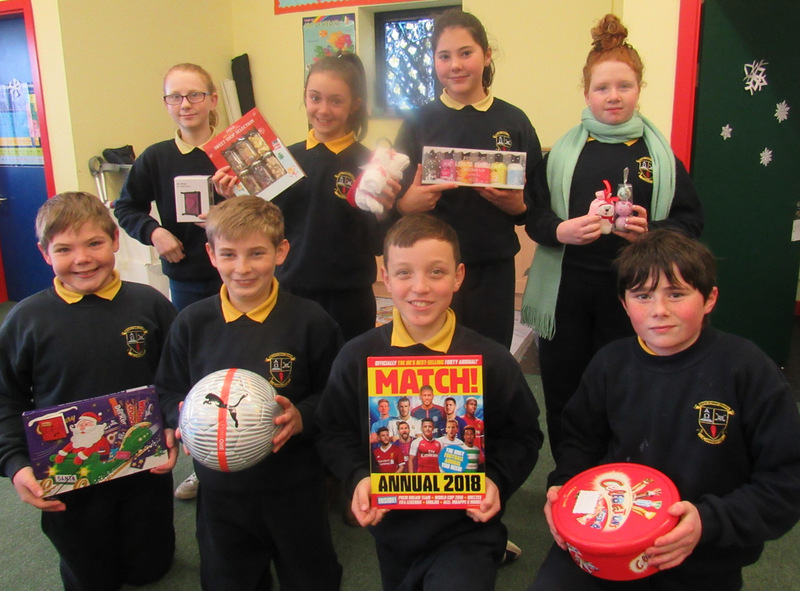 Fastest on the Draw – Quiz Finals 2018: our big buzzer quiz competition came to an exciting end just before Christmas. 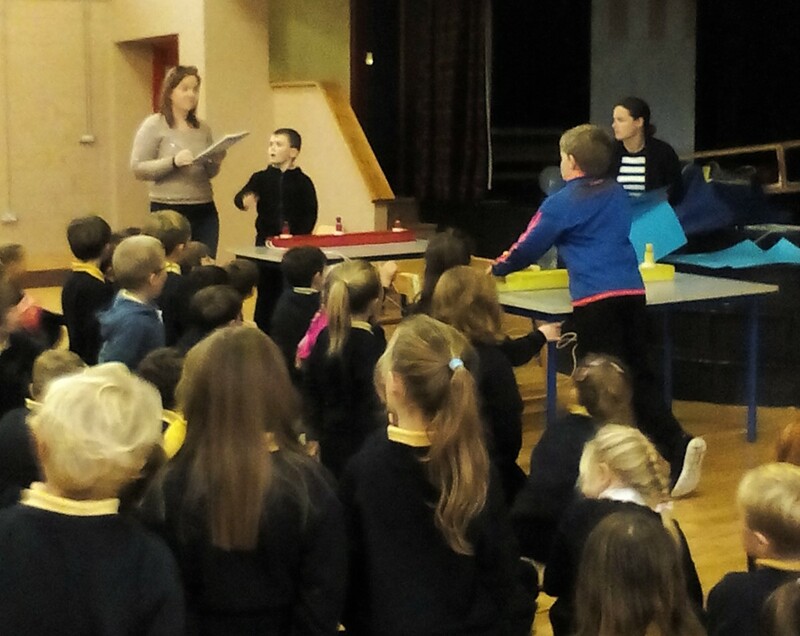 Over 100 students took part in the quiz in teams of 3. 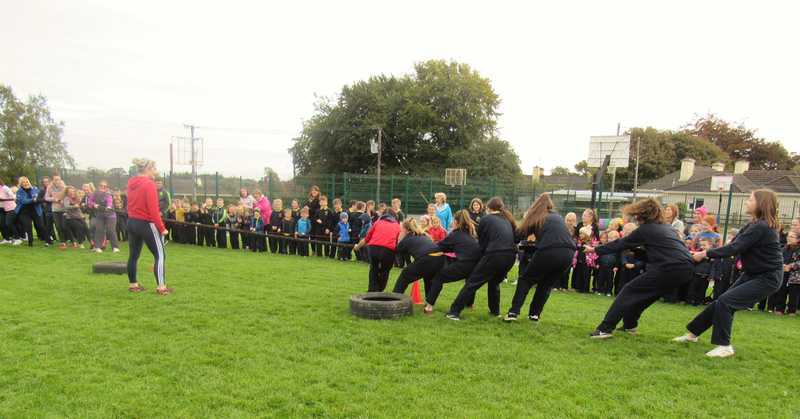 It was a knock out competition for 5th/6th and 3rd/4th. The 4 finalists were understandably very nervous in the final but they all did really well and produced two classic matches that were very tight. 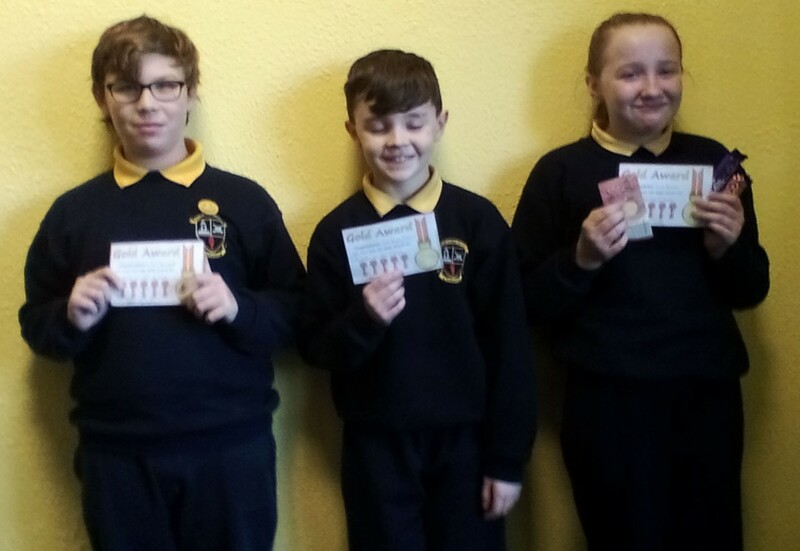 In the 3rd/4th competition, the 4th class team of Bailey, Alicia and Abbie managed to win against Daniel, Bobby and Ryan. 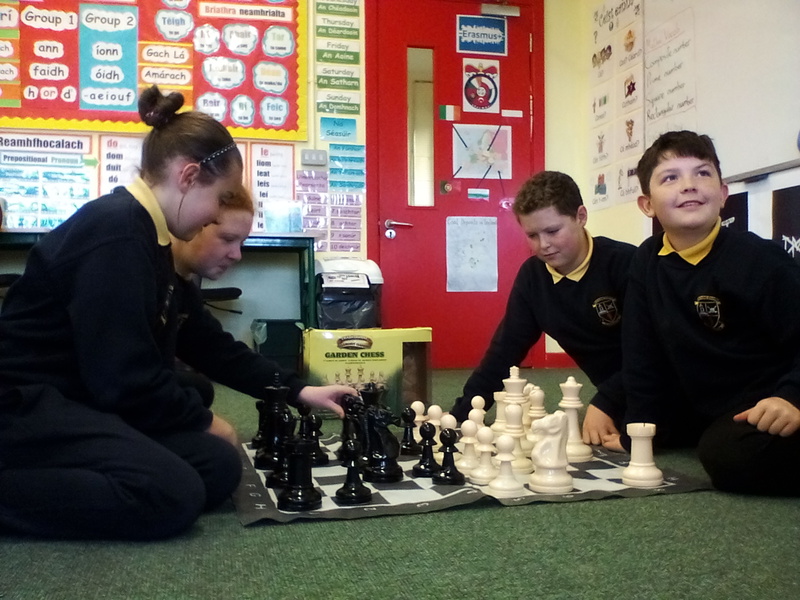 In the 5th/6th class competition, the team of Frankie, Ben and Ciara managed to defeat Senan, Karlo and Roy. Well done to our winners and well done to every student that took part. 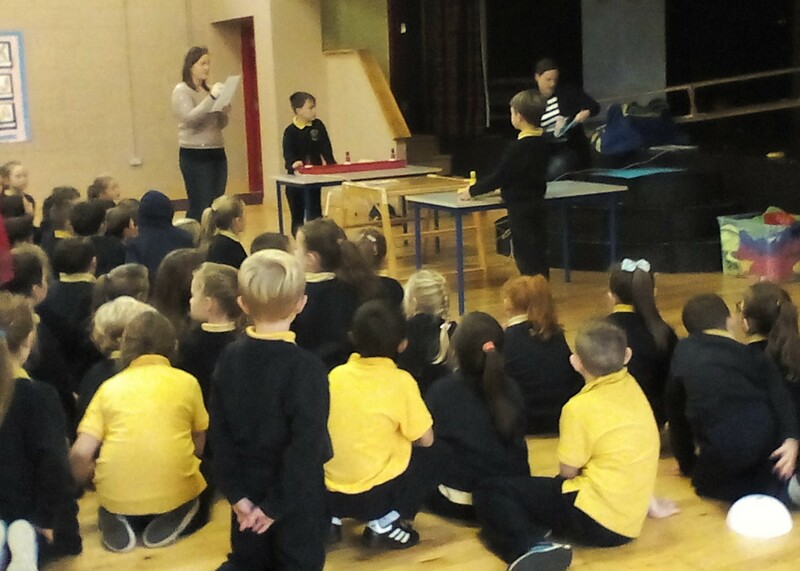 Assembly Performances: Each Friday classes are tasked with putting on a performance on stage at the start of our weekly assembly. 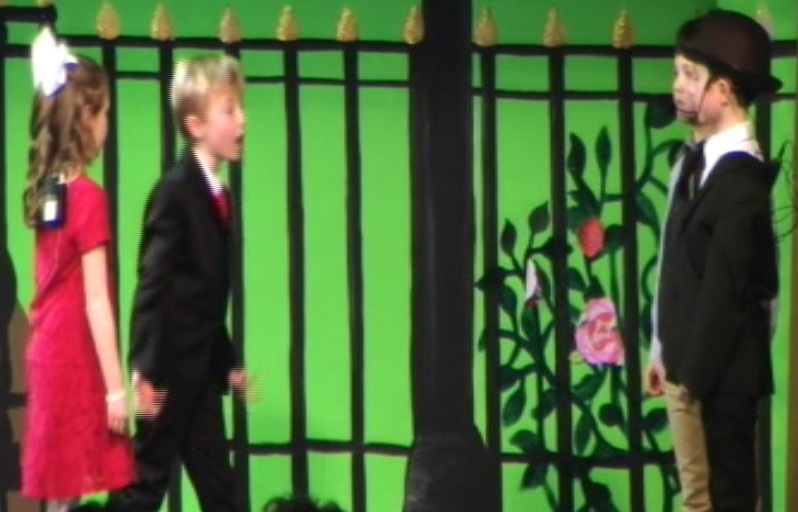 This helps build the children’s confidence and they come off the stage absolutely buzzing. 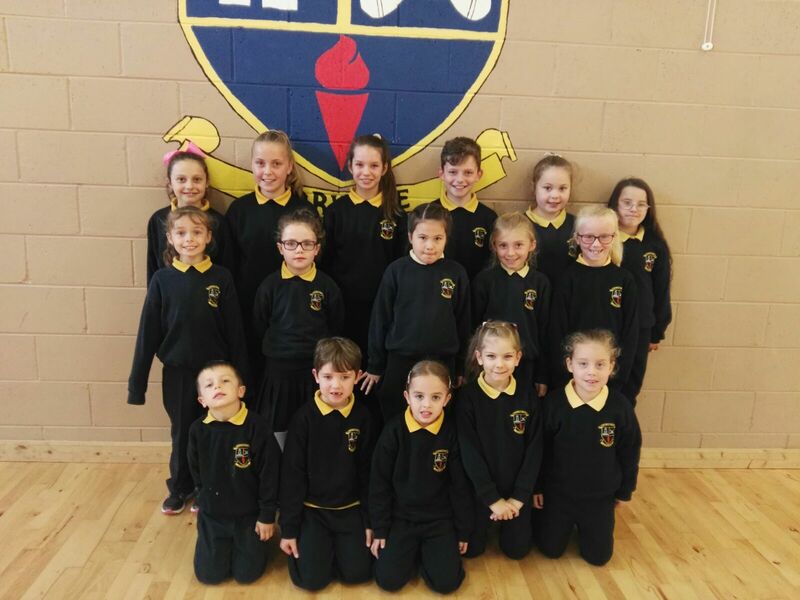 School Choir – New CD: the school recorded a CD before Christmas and we will be looking to have it ready for sale before Valentine’s Day. The recording studio are just putting the finishing touches to it. 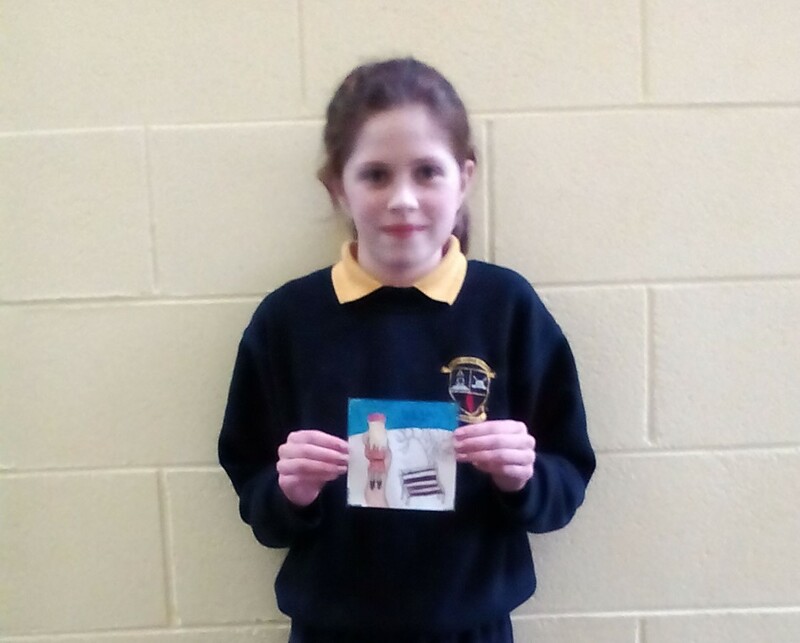 There was a school wide CD cover design competition held last week and the winning entry was from Katelyn O’Rourke Morgan. 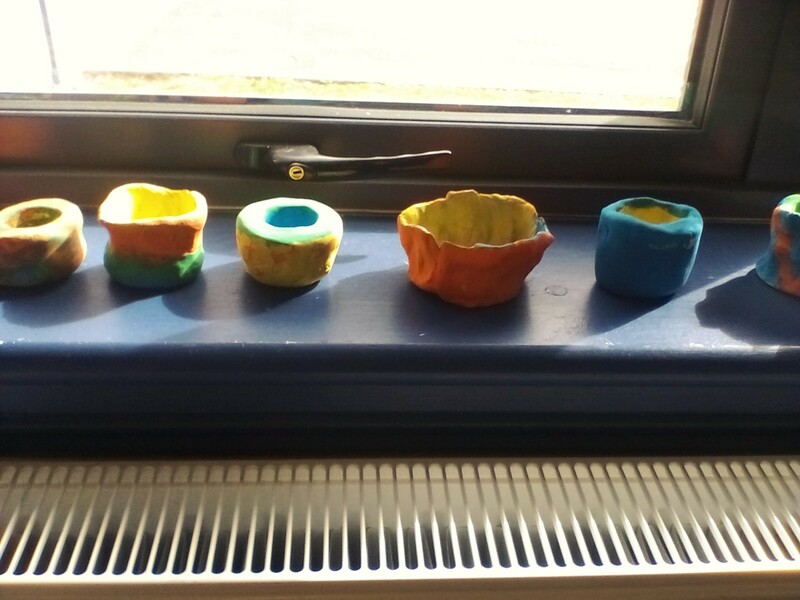 Amber Flag Committee: the school are focusing a lot on mental health this year. 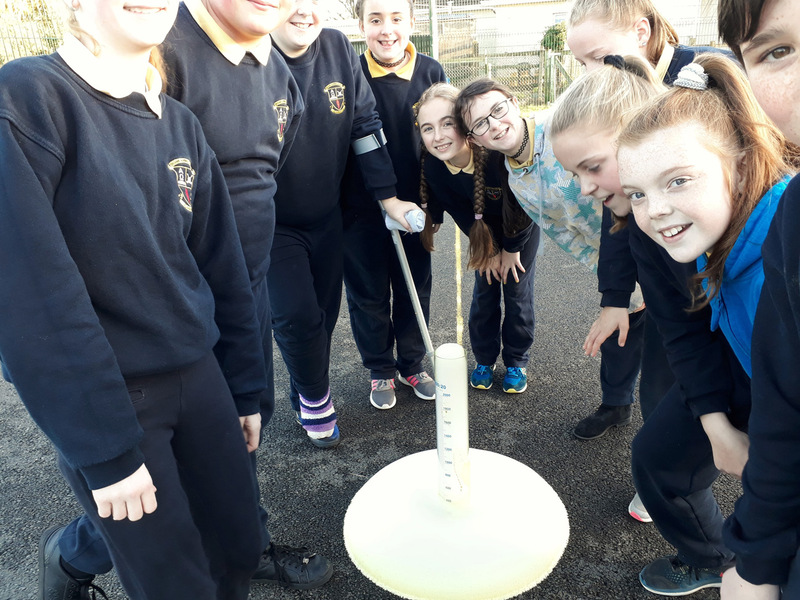 To aid this, we are taking part in the Amber Flag initiative which promotes mental health and well-being for all our students in Corville. 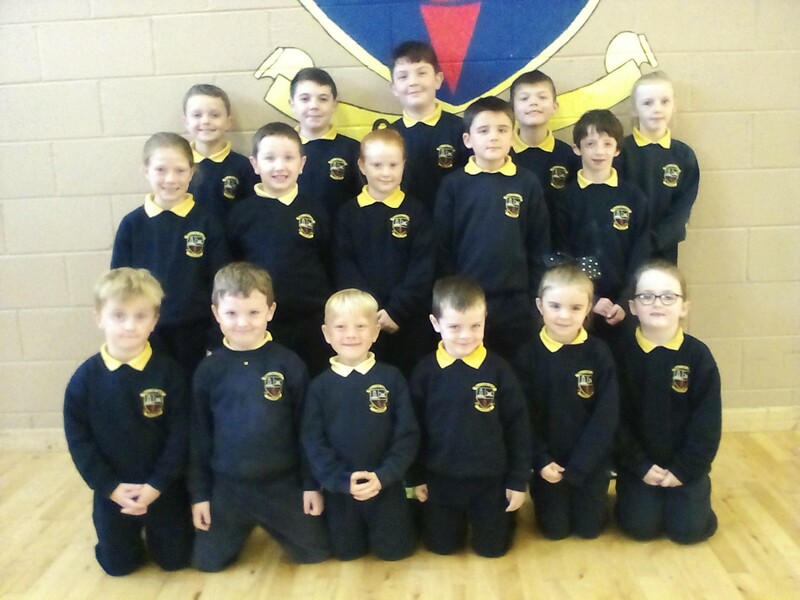 Students from 5th and 6th class will help us throughout the year with various activities. 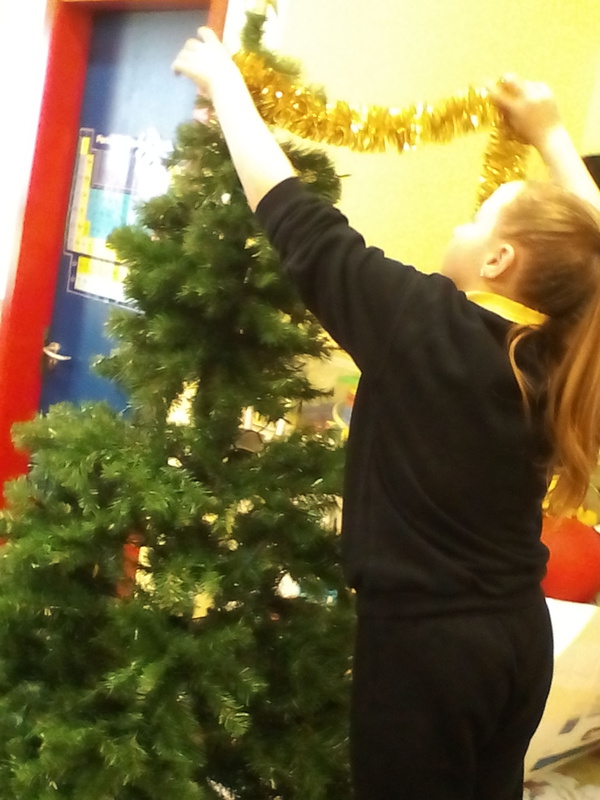 In December, the school were focusing on guided meditation and the feedback from each class was very positive. Two new courses Yoga for Beginners and Practical First Aid will be commencing in the next few weeks. If you have any queries, please ring John Hogan at 087 4038722. Bambino Kart Racing: when you are winning trophies that are almost the size of you, you know that you must be doing something right. Fair play to Conor for his big Bambino Kart Racing wins so far this year. Everyone in Corville are super proud of his achievements and the hard work he puts in every week. We are sure that even bigger results lie ahead for Conor this year and into the future! Student Teachers! 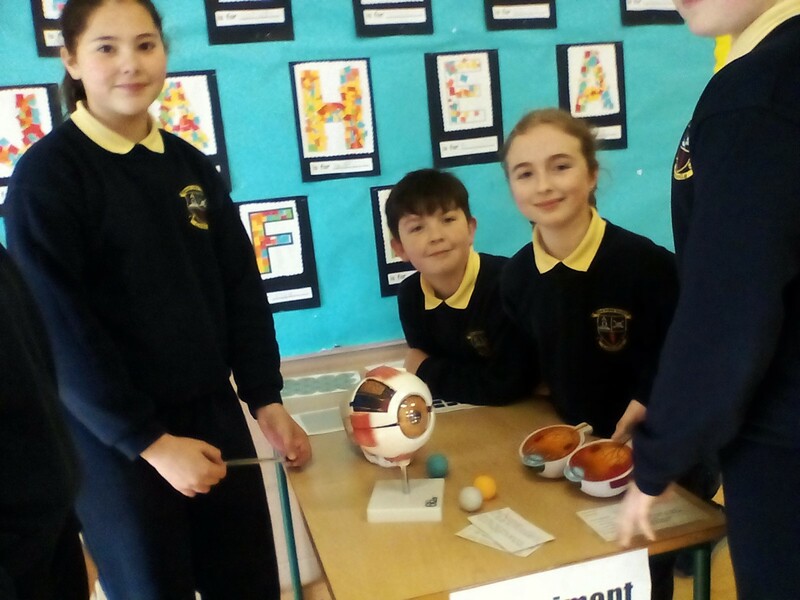 in an effort to increase the confidence and public speaking abilities of our 6th class students we are tasking them with becoming student teachers for a day. 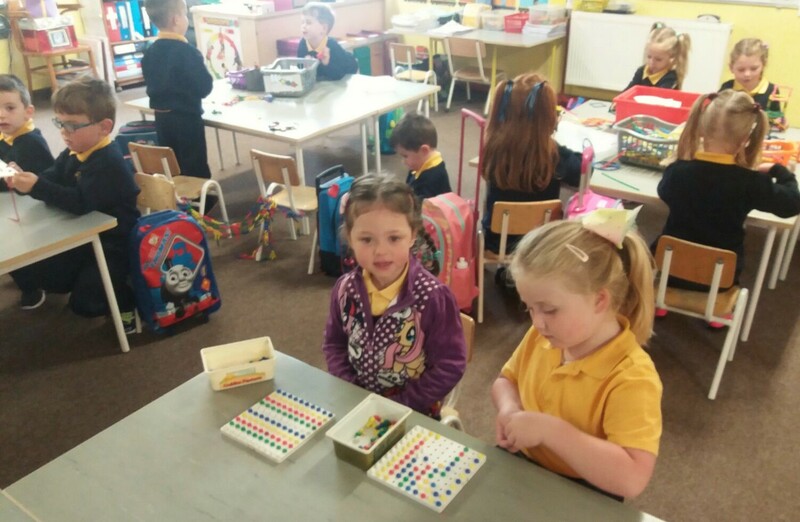 Each student has to come up with a lesson that they will teach the class. 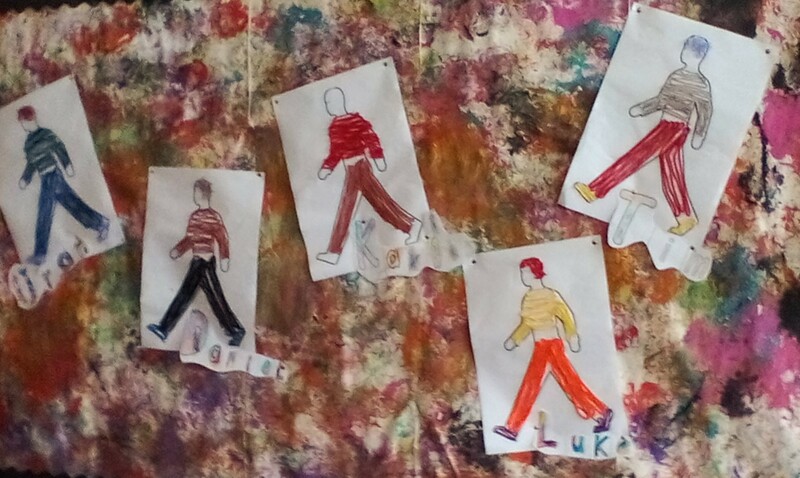 Ideas so far have ranged from soccer skills to Irish dancing and from learning Japanese to still life painting. I think our teachers have plenty to learn from our students judging by those ideas! 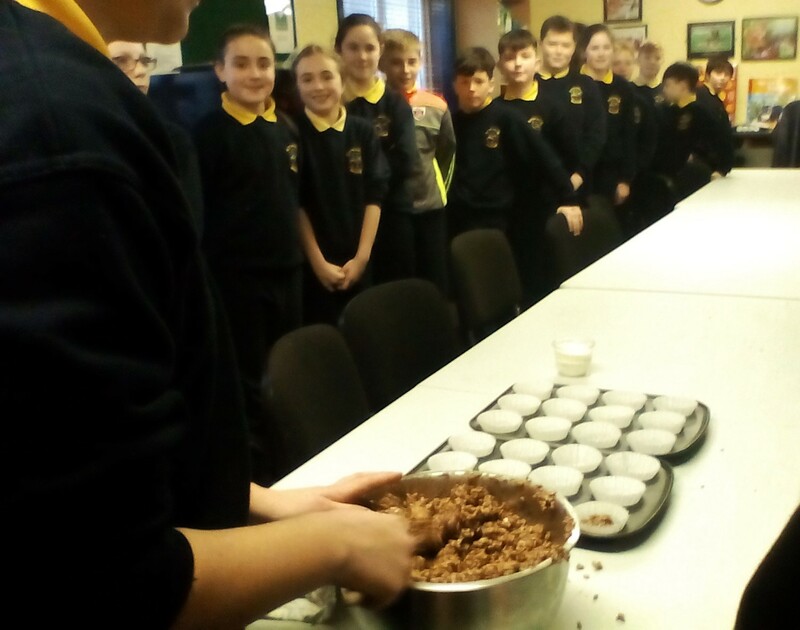 First up to teach was Lucy and her lesson was on making Rice Crispy Buns. You can judge the success of this lesson by the eager queue waiting to get their bun! 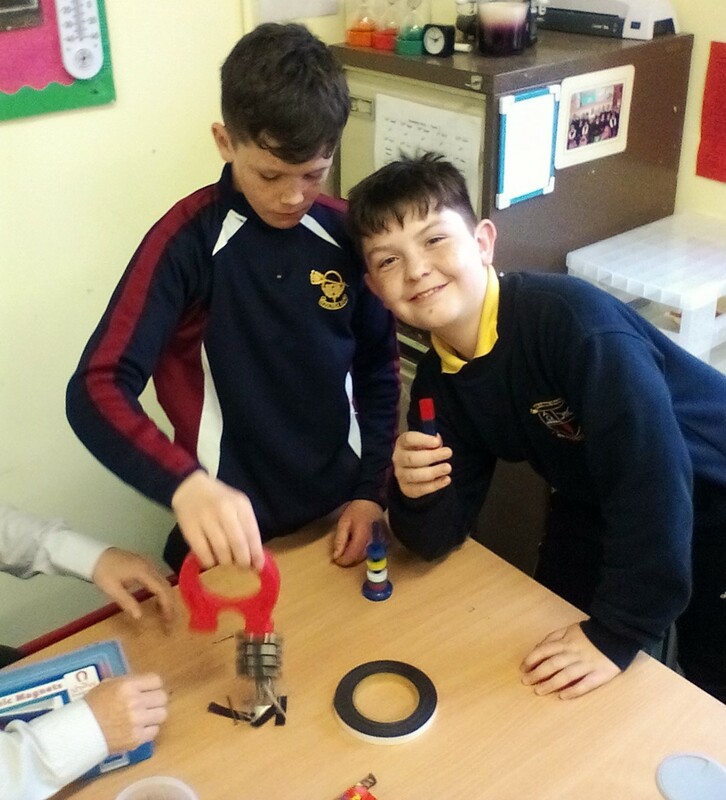 6th Class Blog: our 6th class students continue to update their blog, although sometimes there is so much work to get done in class that it can be hard to find the time to get it done! 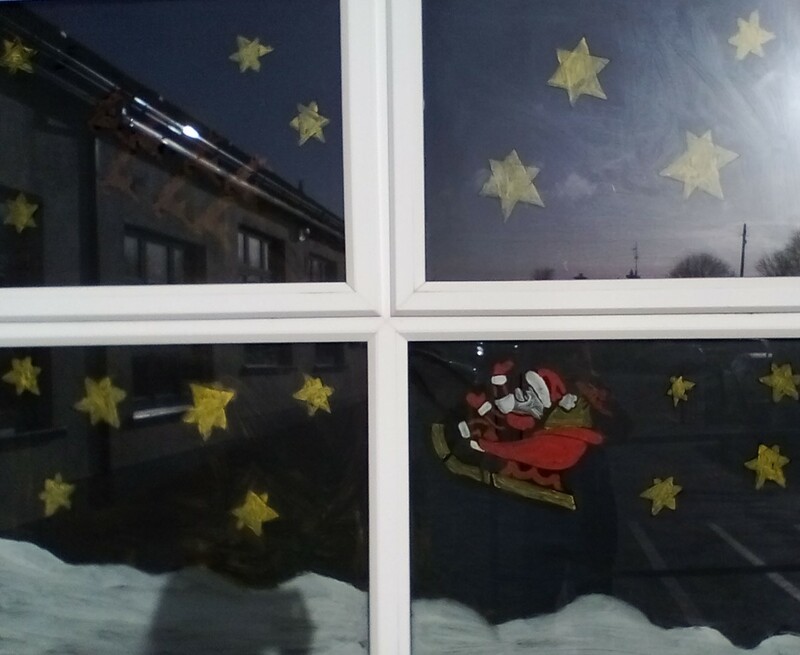 Recently they have been blogging about – decorating their classroom for Christmas, Secret Santa, a new HTML coding project they started, attending Beauty and the Beast in Coláiste Phobail, preparing for Confirmation and much more. 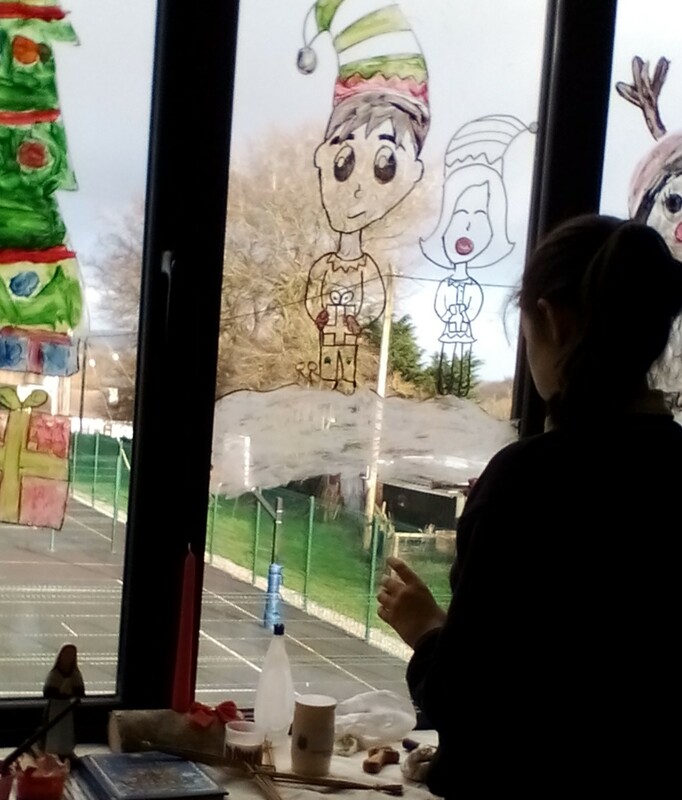 Preparing for Christmas: the school was looking very Christmassy in December. 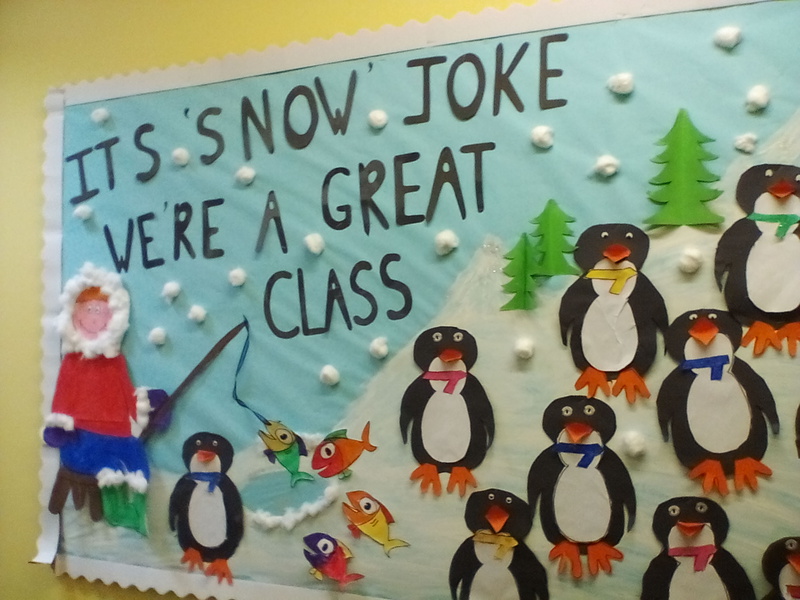 Each class put a lot of work into decorating the school and their classrooms. 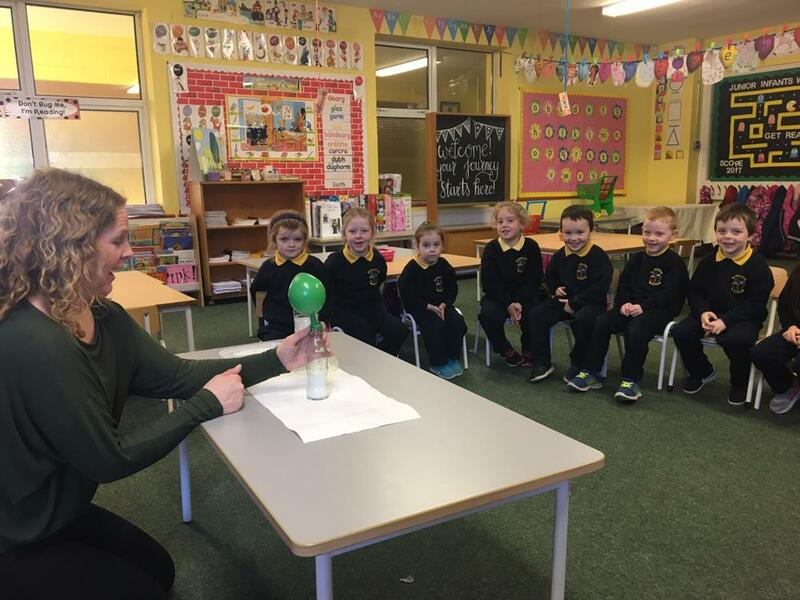 The school was a hive of scientific activity all week as the staff and students donned their white coats and led a week long exploration into all things science as part of National Science Week. The students will certainly have plenty of memories from the week. Personally the Whoosh jet engine experiment or Dragon’s Breath will stay etched in my memory for quite some time. I think you can imagine what was involved in those experiments from their names alone! 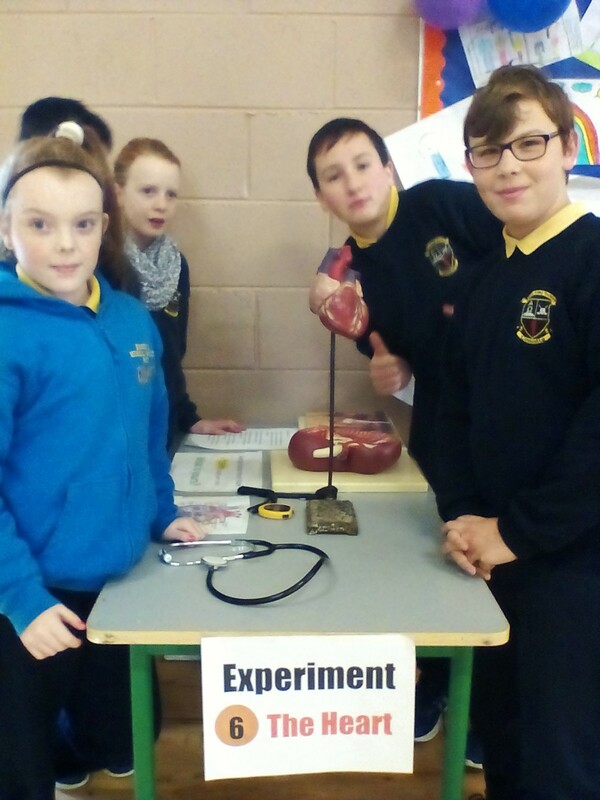 Stars of Science Week were our 6th class students who held a ‘6th Class Science Exhibition’ all day Wednesday. 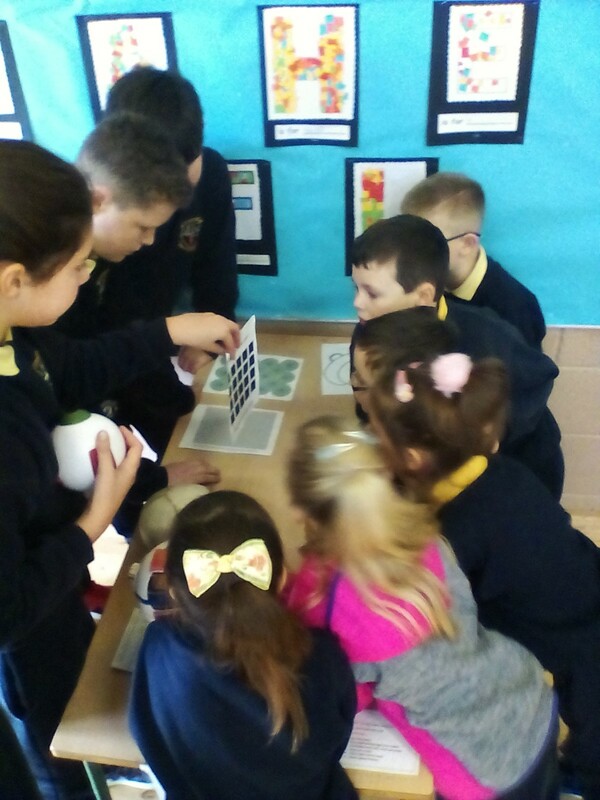 Both of our 6th classes were divided into groups of 5 and they each had to present an experiment at the exhibition. 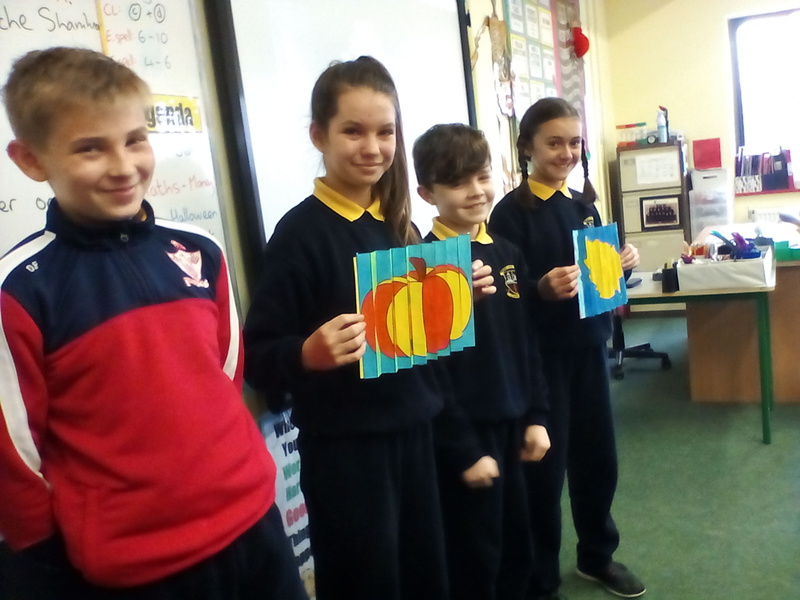 It proved to be a long day for the students as they ended up having to make their presentation 40 times for all the different class levels in Corville. They were well and truly exhausted by the end of the day (now they know what it’s like to teach! ), but they did a fine job and everyone in Corville is very proud of their efforts. It was great seeing the smiling faces on all the students as they left the exhibition. That is a sure sign of a job well done! 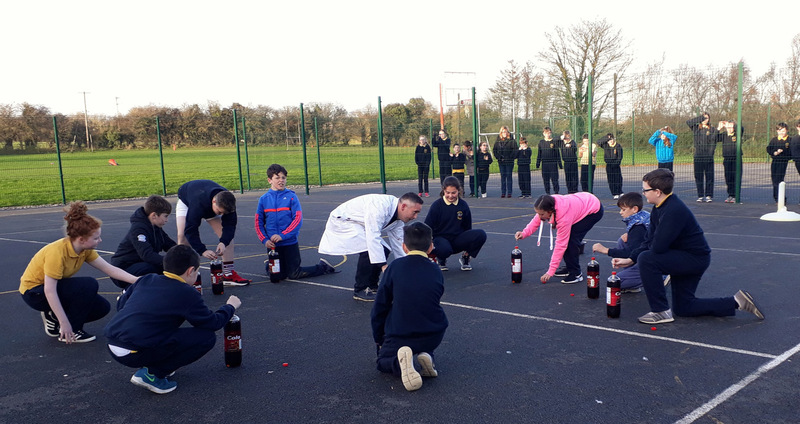 As a reward for their exhibition, the 6th class students and one student from each class that was deemed to be the ‘Scientist of the Week’ got to go to Mr. Scully’s Room to enjoy an hour long science presentation that involved lots of explosions, fire, burning, flaring and even dissecting. 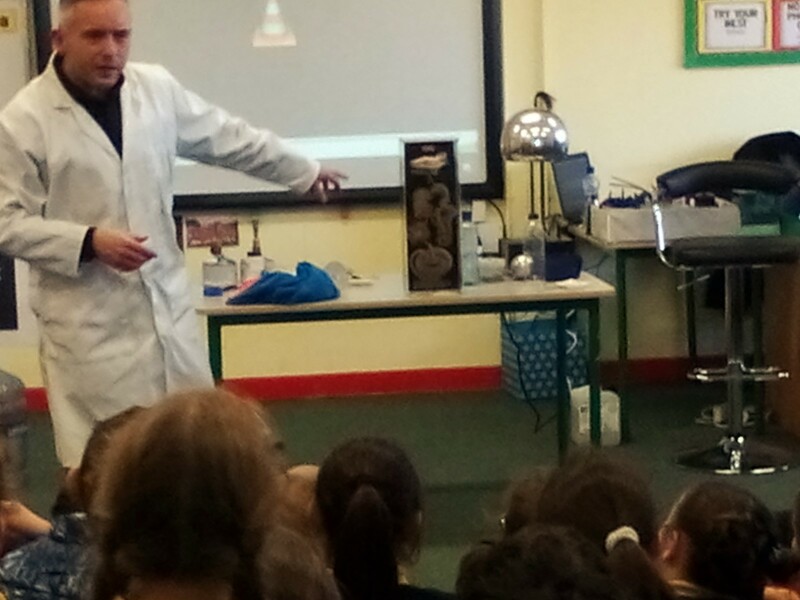 The school would like to thank Mr. Scully’s brother (another Mr. Scully) for coming to the school to mesmerise the students with some truly wonderful experiments. 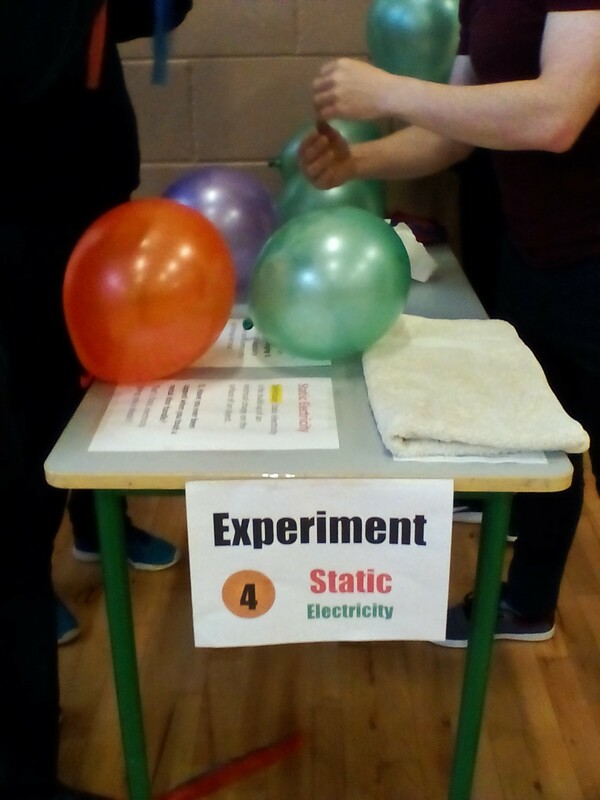 The above activities weren’t the only bits of science going on in the school. 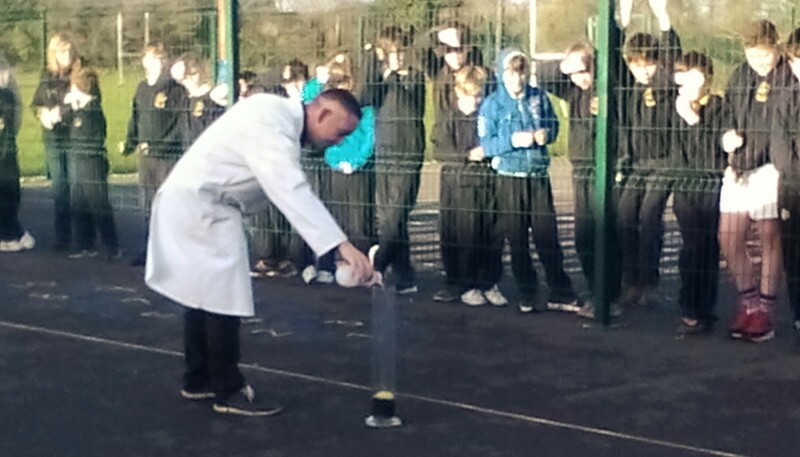 Ms. McManus visited all the junior classes to show a range of cool experiments. 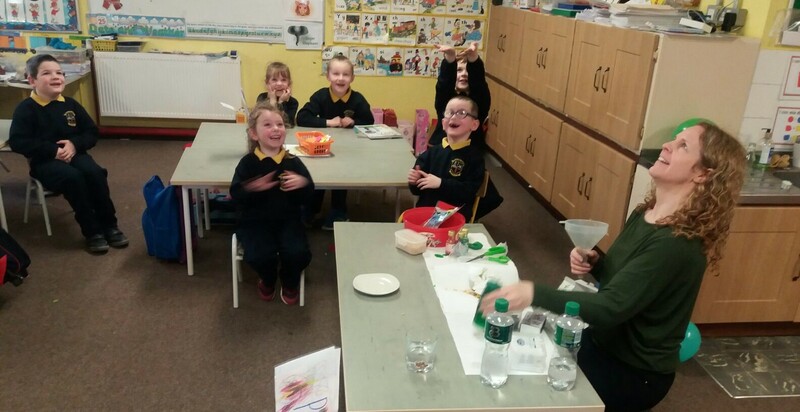 Ms. Fitzpatrick got her 6th class students to do a bread experiment that highlighted the quick build up of bacteria when the bread is touched by unclean hands. 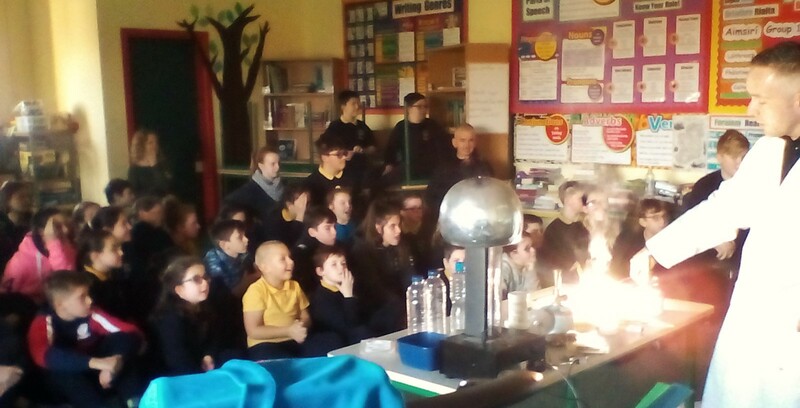 Finally, all the individual class teachers made their own attempts to bring science into the classroom. All ‘n all it made for a great week in Corville. 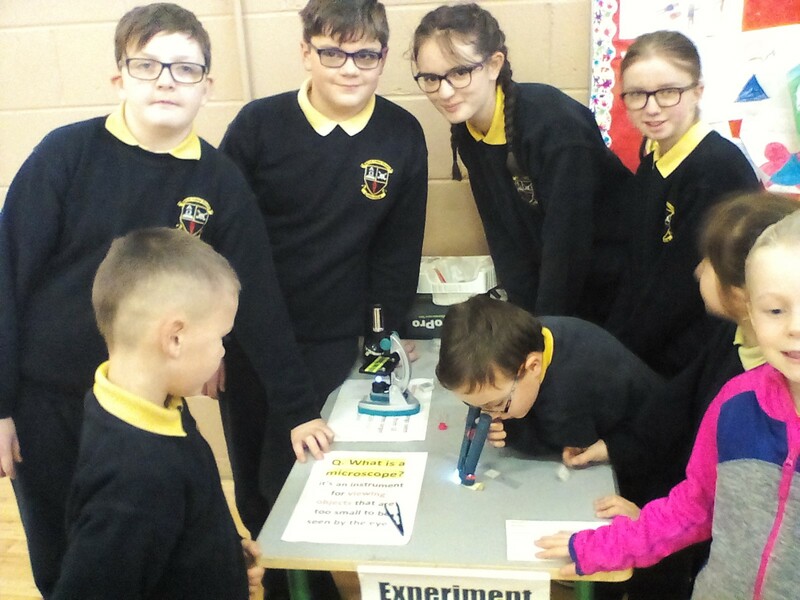 Fair play to all our budding scientists of the future! 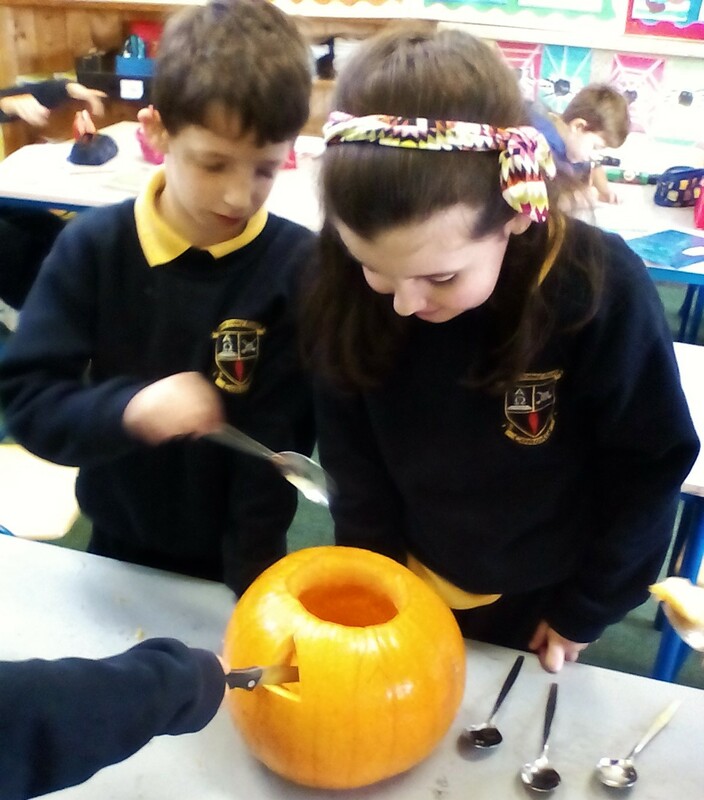 All the students have settled back in quickly after the Halloween break. 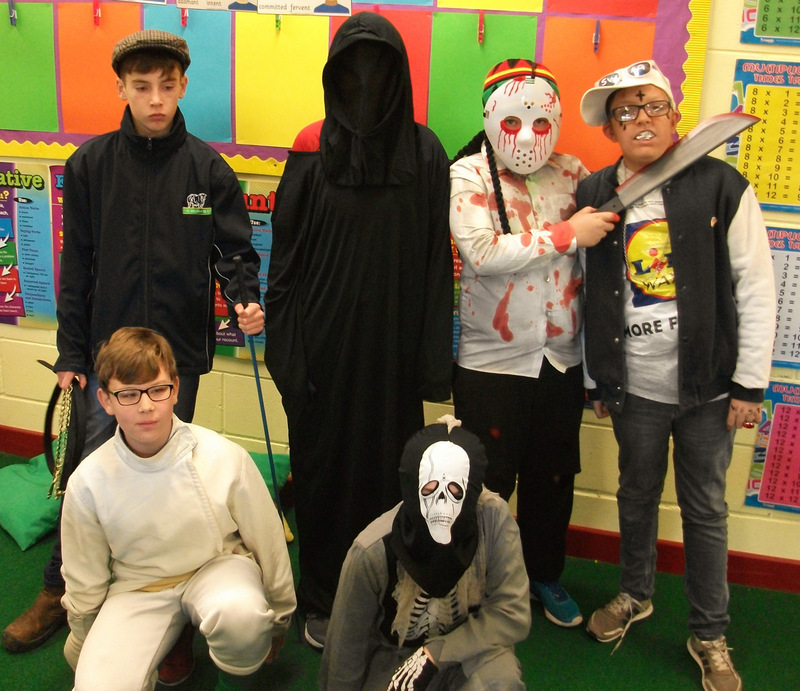 The children looked very spooky in their costumes before the mid-term break. 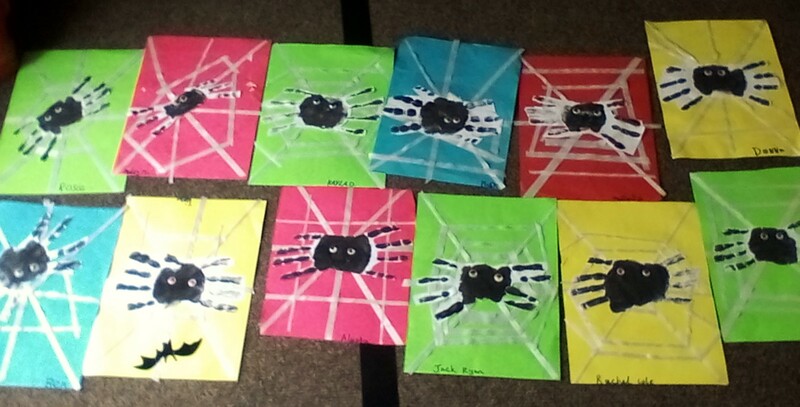 It’s a shame to have to take down all the wonderful decorations and Halloween inspired artwork from the walls. All eyes now turn to Christmas which will be here before we know it! 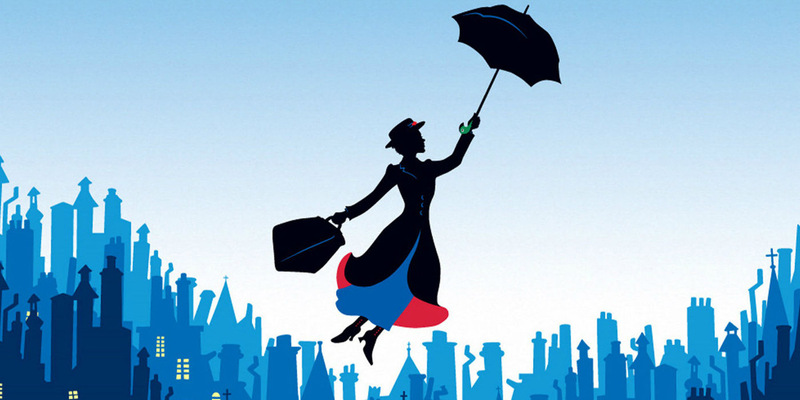 School Play: At this time of the year the major focus in the school is on our school play which this year will be Mary Poppins. Ms. McMahon and Ms. O’Connell have just finished rehearsals and now it’s down to the hard task of learning lines and putting it all together. 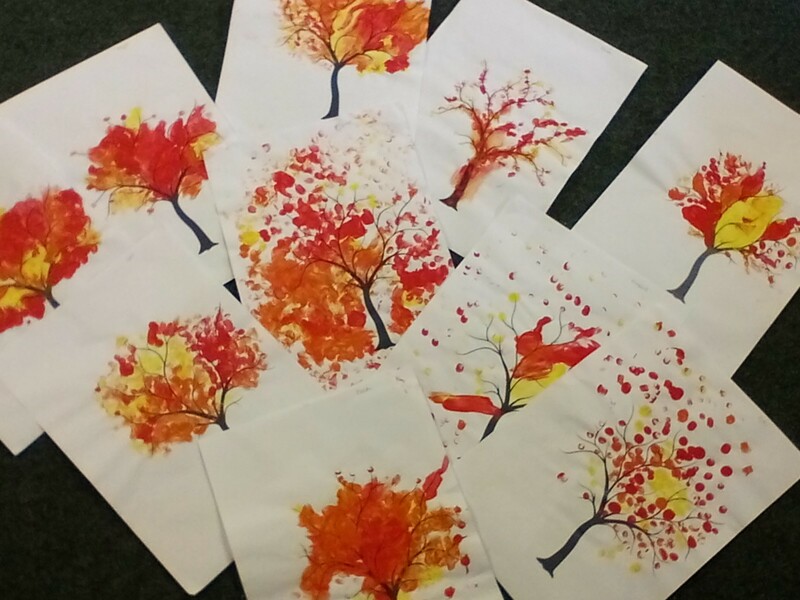 There is a huge amount of work involved but we are sure it will be alright on the night! 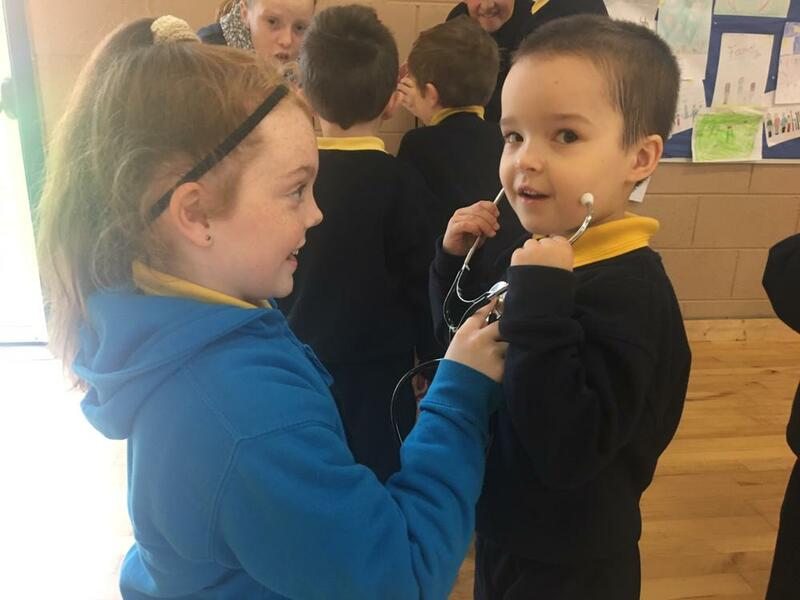 This year it is the turn of the junior end of the school, so all classes from senior infants up to 2nd class will be involved. 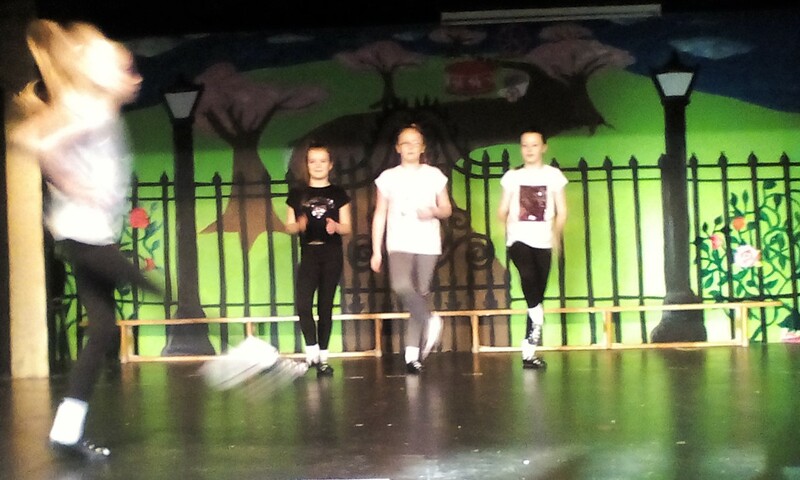 The production promises to be supercalifragilisticexpialidocious! 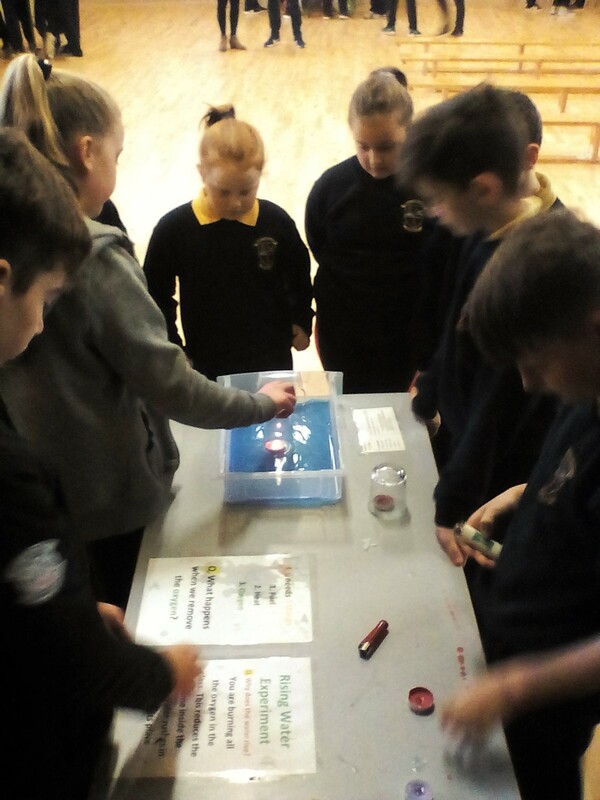 Maths Week: the school enjoyed a very challenging maths week last week. 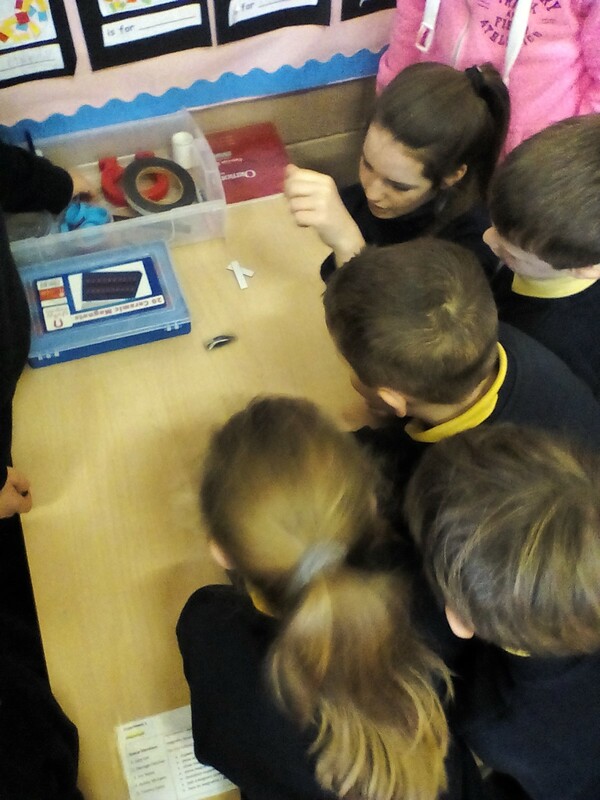 Everyone had their problem solving faces on all week as each class took part in a range of different activities. 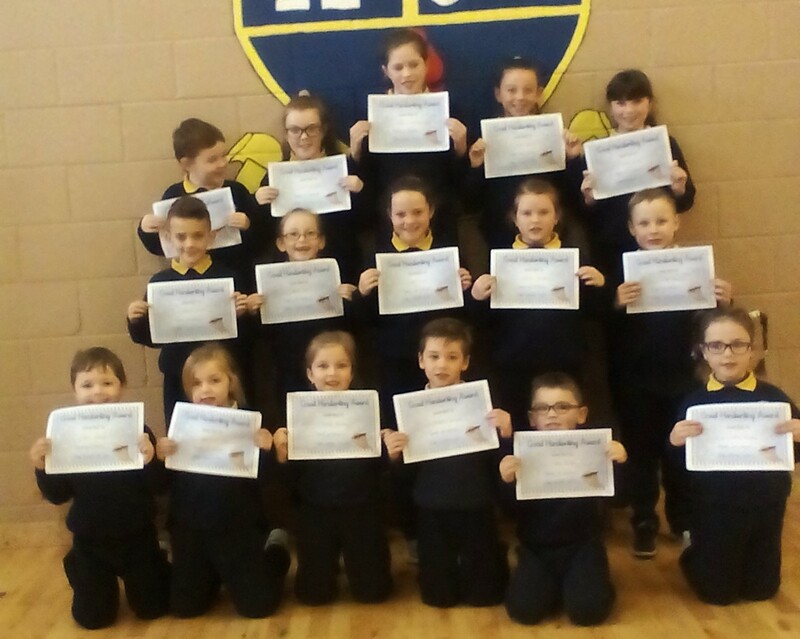 There were maths problems to solve every day and we had an award for maths students of the week from each class. 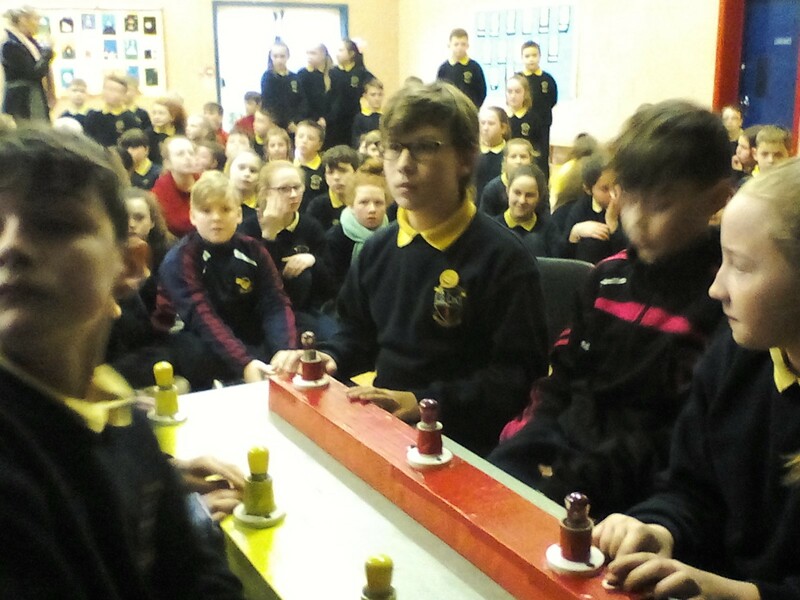 The highlight of the week was the buzzer quiz maths competitions between each of the different class levels. There was plenty of friendly rivalry on display! Handwriters of the Month: we like to reward our students who shine when it comes to penmanship. 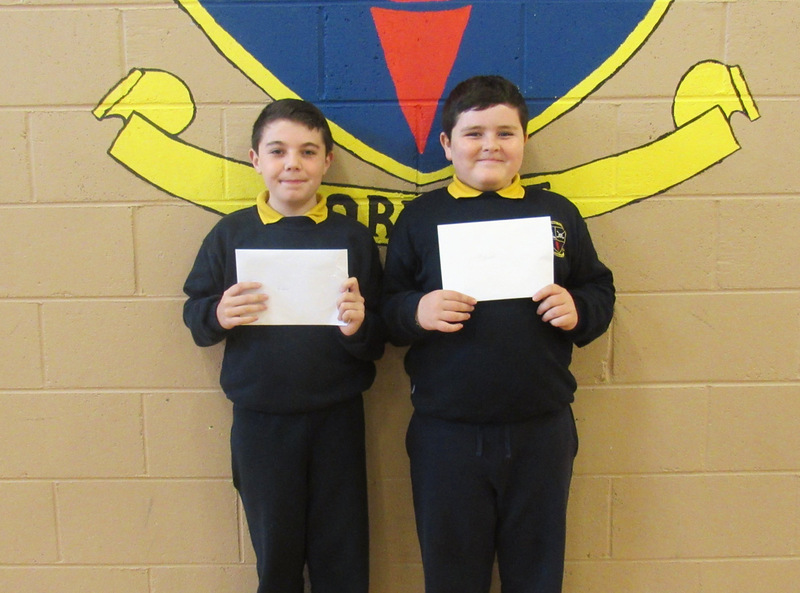 Here are our winners for October. 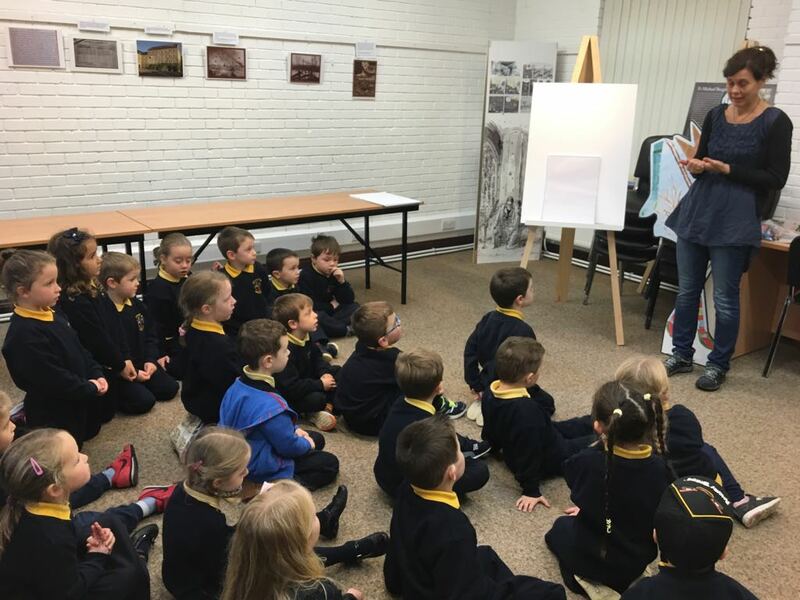 School Choir – CD Recording: two weeks ago was a very special week for the boys and girls in the school choir as they got the chance to record a CD! This was a massive accomplishment for all the students and teachers involved. Ms. Browne and Ms. Kelly worked wonders with the group and they managed to really shine on the day. We have yet to get the CD back from post-production, but when we do you will be the first to know. Erasmus Trip to Bulgaria: 5 lucky Corville students got to travel to Bulgaria for the week as part of the Erasmus+ programme. 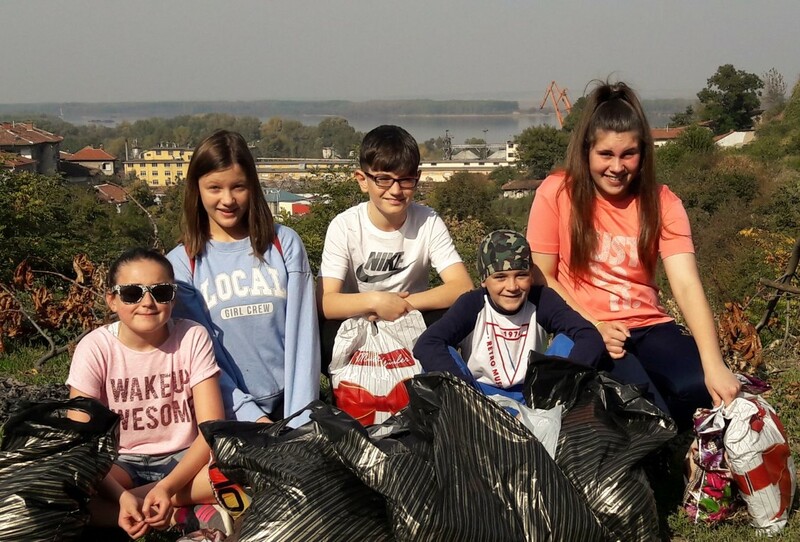 The lucky five were Brian, Michael, Ava, Molly and Anastasia (seen pictured below beside the Danube river after some shopping!). The 5 students were a credit to the school and showed great manners throughout the trip. 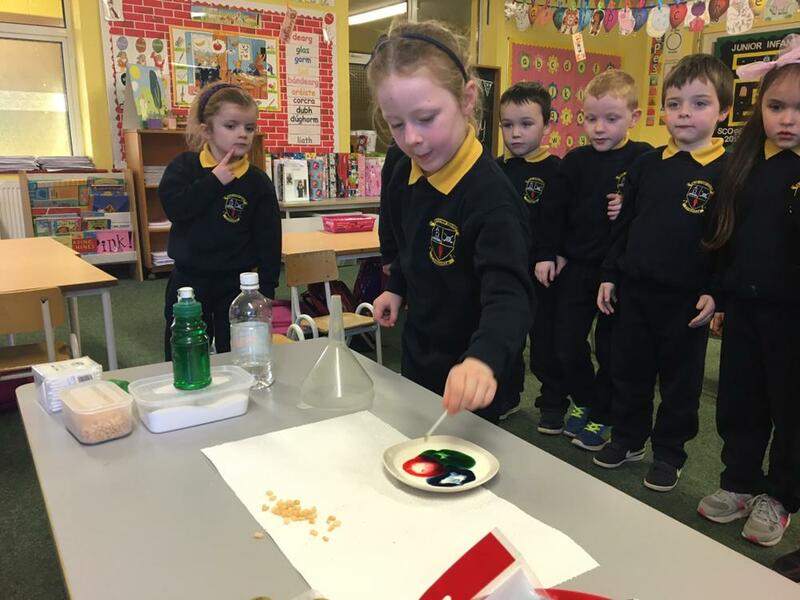 What have our Junior Infants been up to? 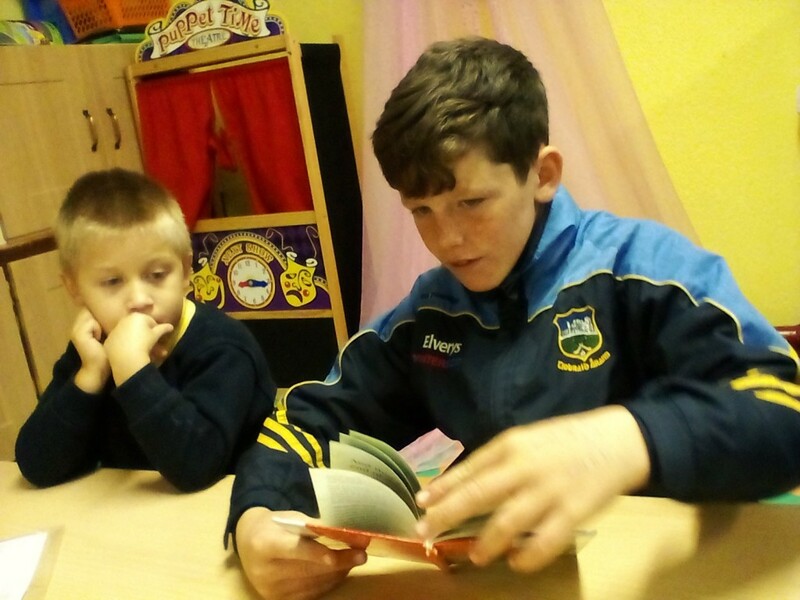 Ms. O’Connell’s class went to the library for the first time. They were super excited about the trip and had a great time. 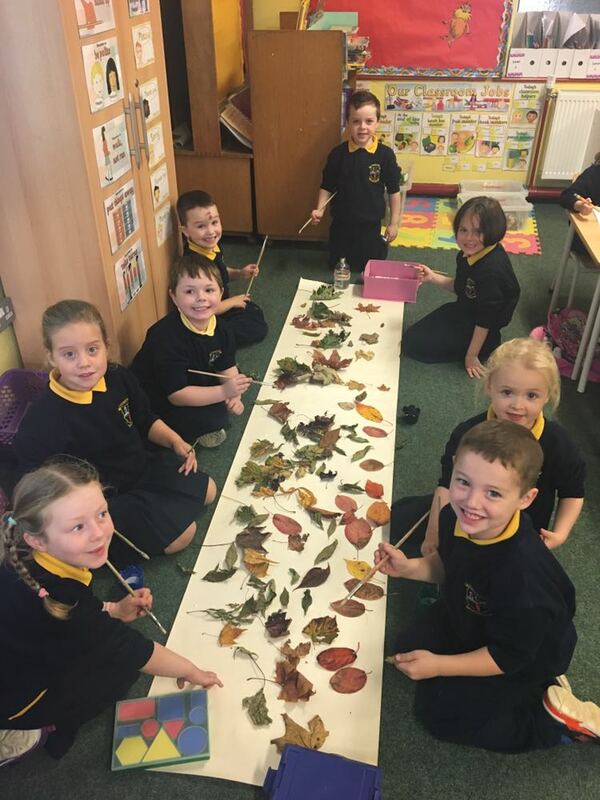 They also learned all about autumn and made a beautiful leaf collage. 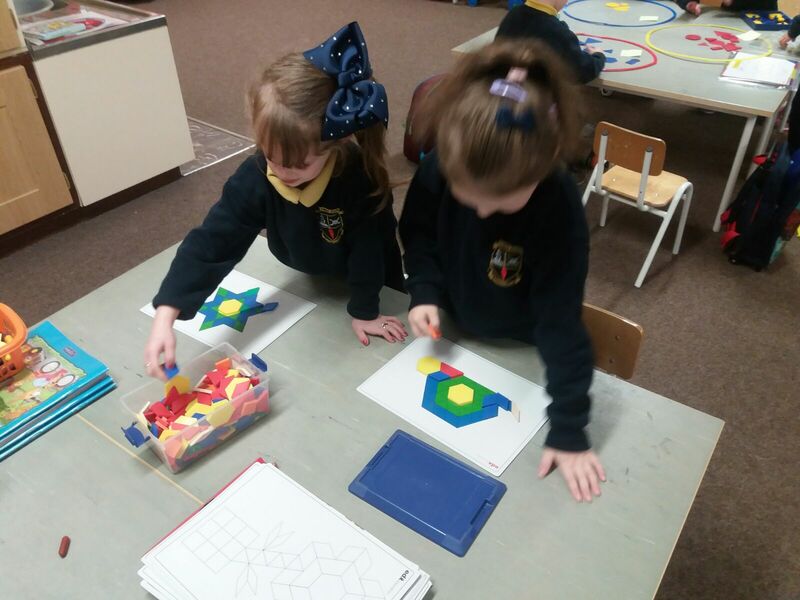 Ms. McMahon’s class were focusing on learning shapes for maths week. 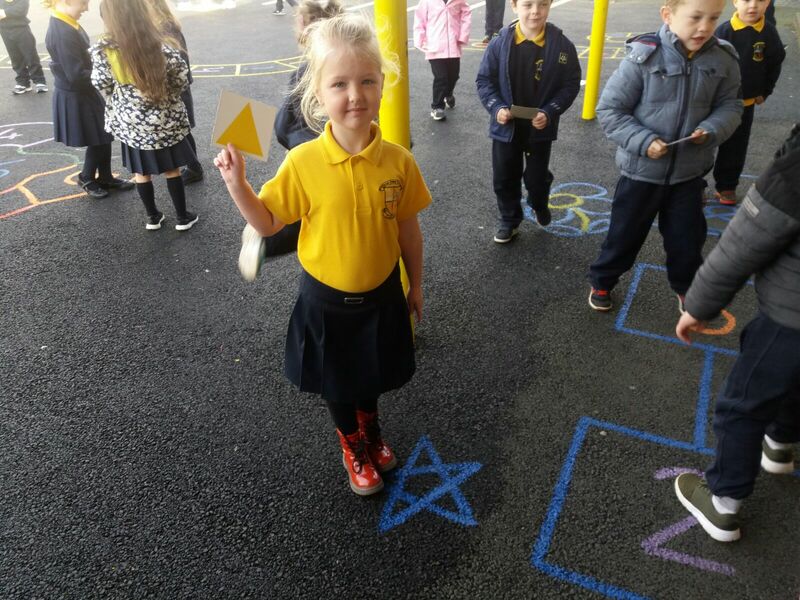 They took part in a shape and space hunt in the yard as well as sorting shapes in class and making cool shape pictures. Football Results: Last year we won 4 out of 5 county finals in football. This meant that Corville were promoted to higher divisions for this year. All our teams put in a great effort at training but they were always going to be up against it against the strongest football schools from around the county. 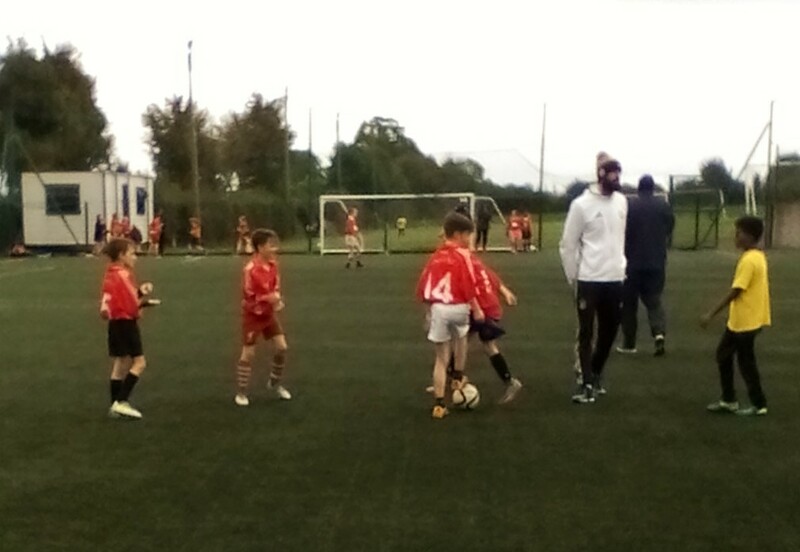 Over the last 3 weeks our Boys U/13, Boys U/11 A + B and Girls U/11 teams were all in action. 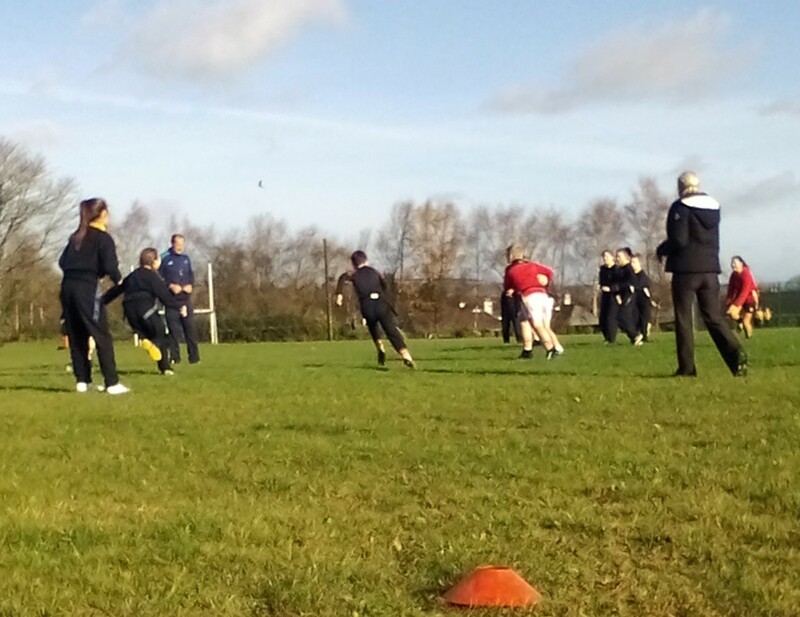 All 4 teams performed well in their respective blitzes but were just edged out each time and failed to proceed to the county finals. We were by no means outplayed at any of the blitzes so if we keep putting in the same effort over the next year then I am sure we are destined for great things next year. 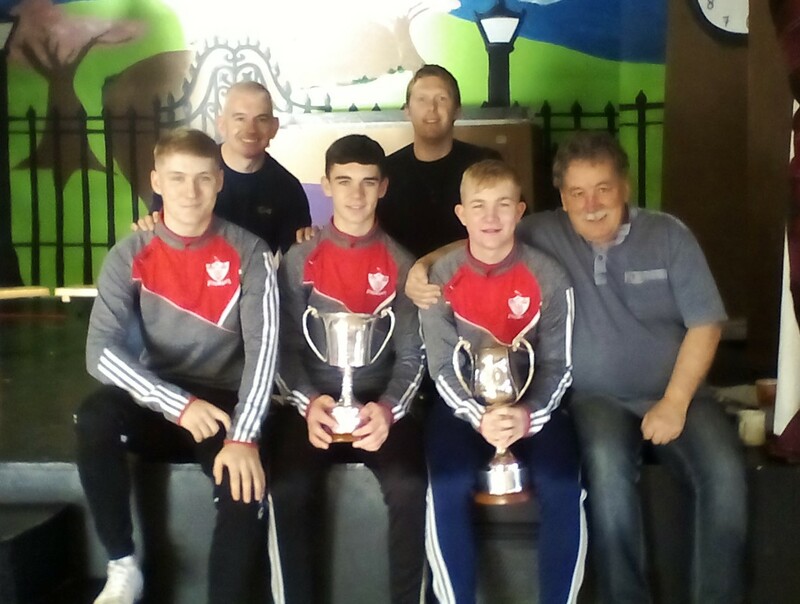 Roscrea Minor Hurling Team Visit: we were delighted to welcome members of the Roscrea minor winning team to the school recently. It was especially great to see former school students coming back to show the current generation of Corville students what is possible. 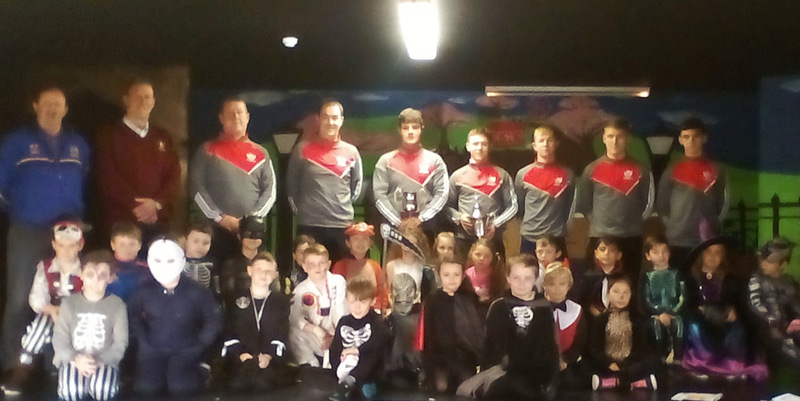 Everyone here in Corville are delighted to see the success of the Roscrea underage hurling teams. 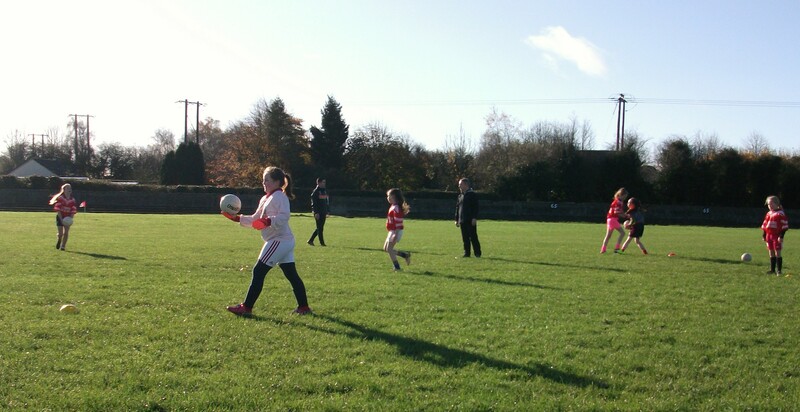 Tag Rugby: has started up once again in the school. 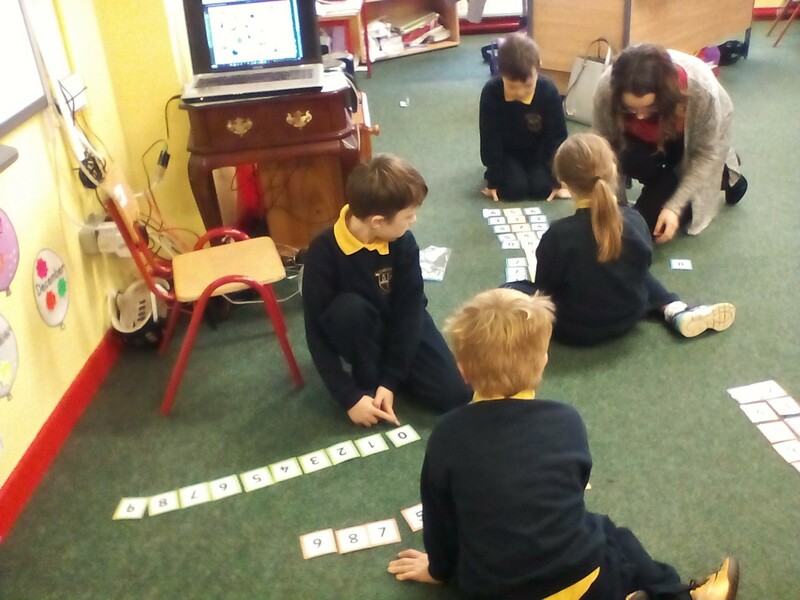 Each class will get an opportunity to take part in lunch time games throughout the year. 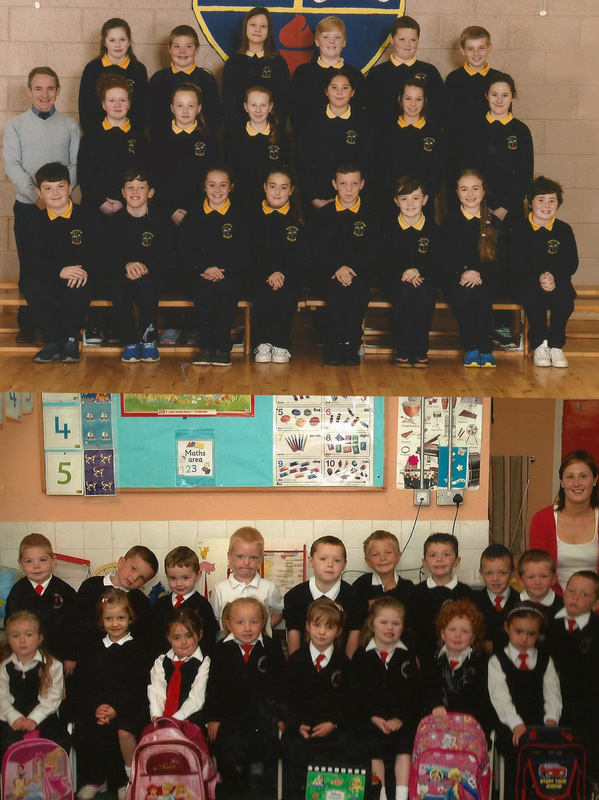 First up were the boys and girls from 6th class. 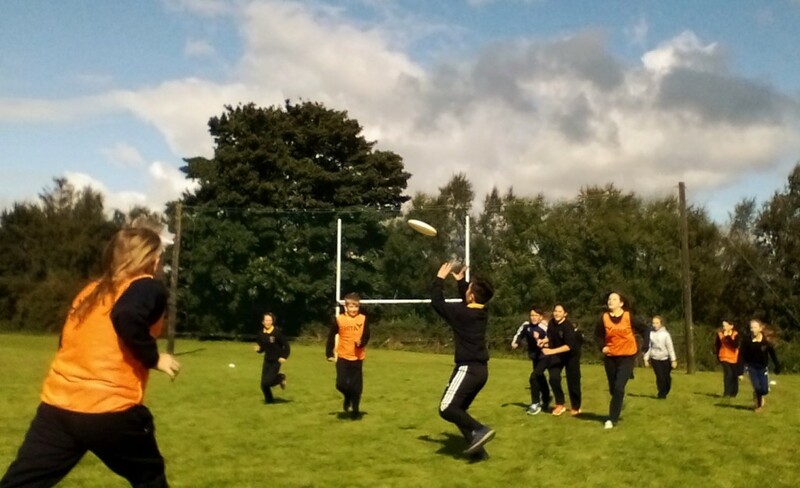 Ms. McCormack made sure everyone had a great time and learned a few rugby skills. Tennis: Ms. Darcy and Ms. Dillon are doing a great job coaching tennis after school. Tennis is now on Mondays from 3:00 – 4:00. 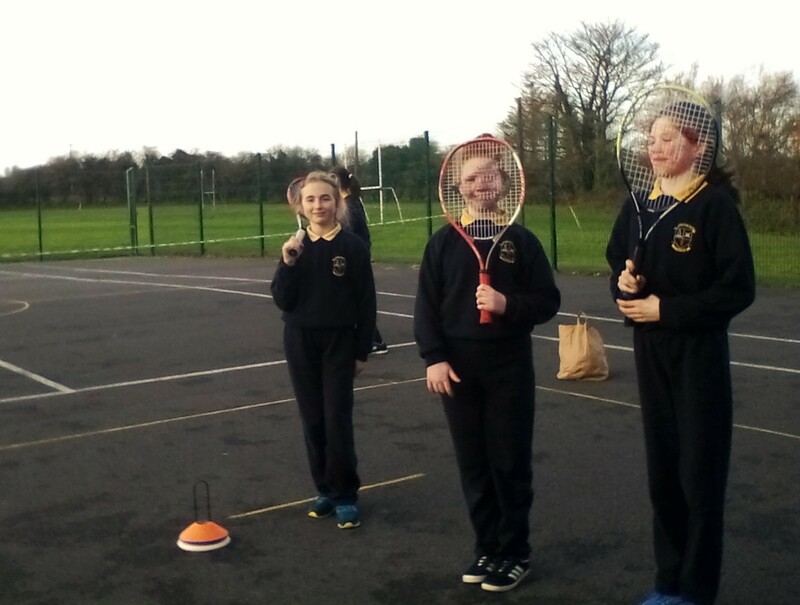 It is great to have such a wide variety of sports available for the students. There is something here for everyone, even for those that are not overly fond of having their photos taken! 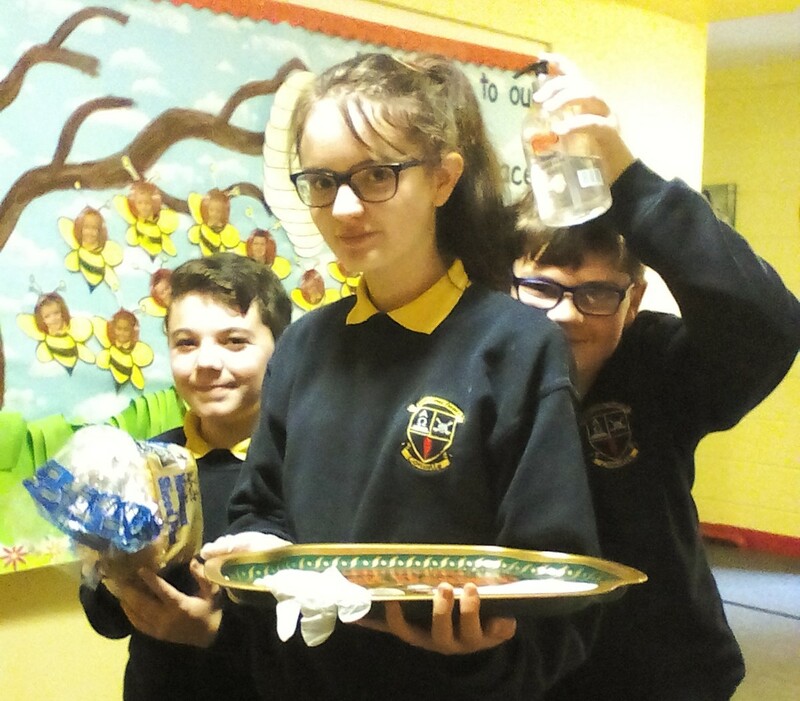 6th Class Blog: our 6th class students continue to blog about their experiences in what is their final year in the school. 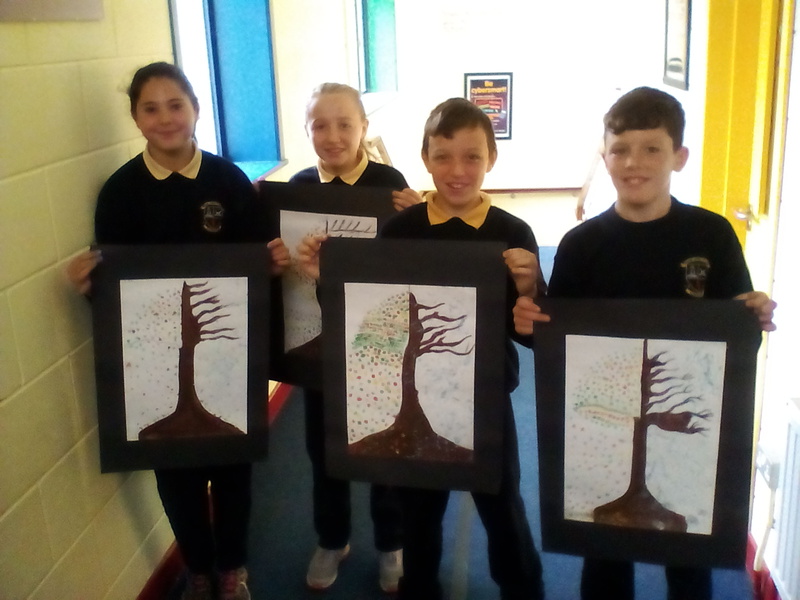 The students were delighted to learn that Lucy Lee had won 1st place in the Credit Union Art Competition. 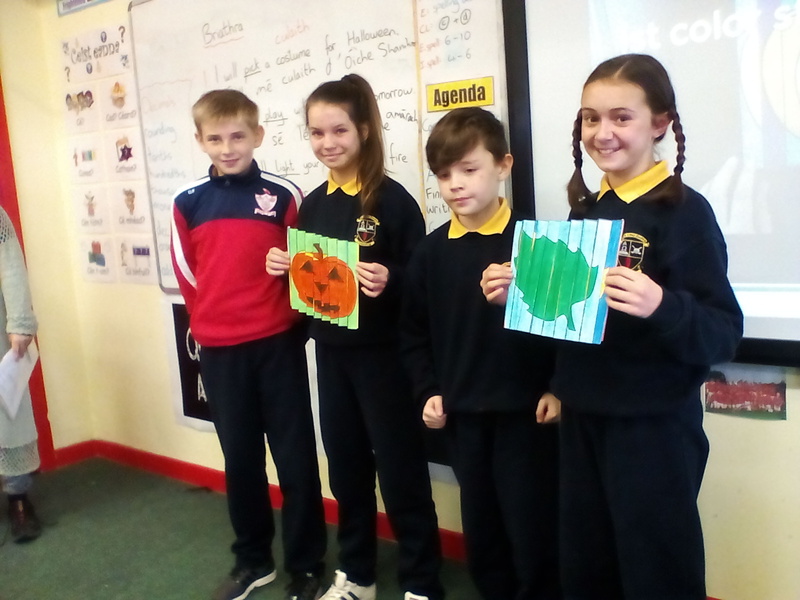 They also blogged about learning a new game called 4 Square, taking part in magnetism experiments, and creating seasonal art and Halloween agomographs (a series of images that change at different angles!). 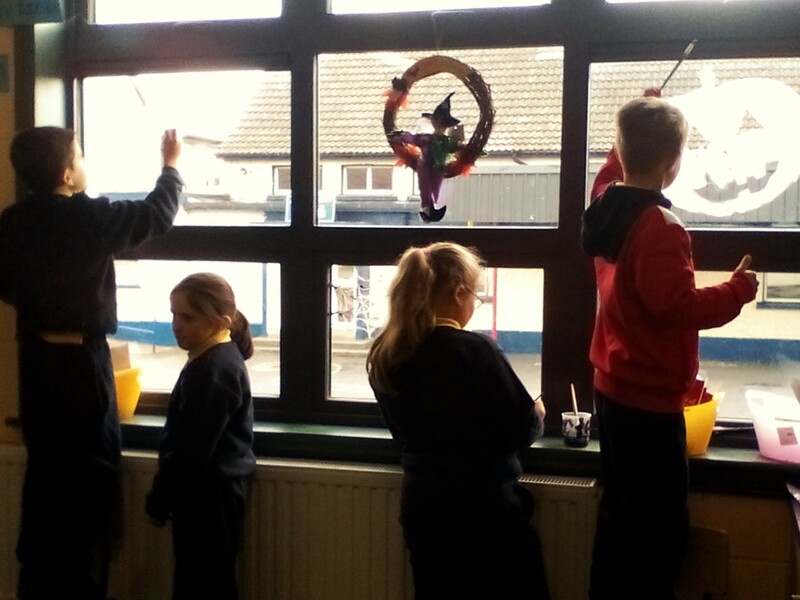 The year is flying by and the students are already hard at work decorating the school for Halloween. 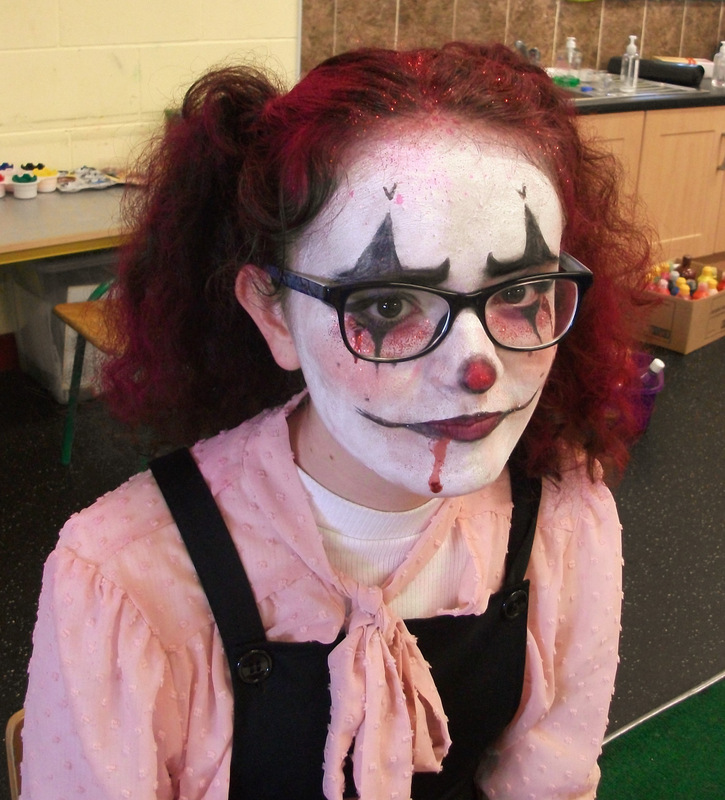 The school is looking very spooky at the moment! School Choir: preparations are coming along nicely for the recording of our CD. 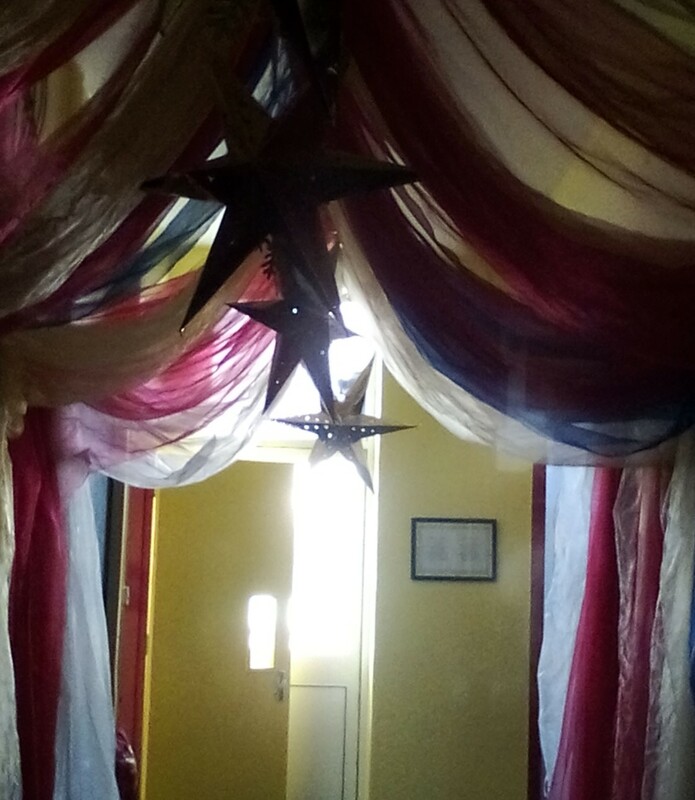 The choir are practicing every Tuesday and Thursday and hope to go into the recording studio some time before the mid-term break. This will be a wonderful experience for all the girls and boys involved and I am sure they are all looking forward to it. Practice makes perfect. 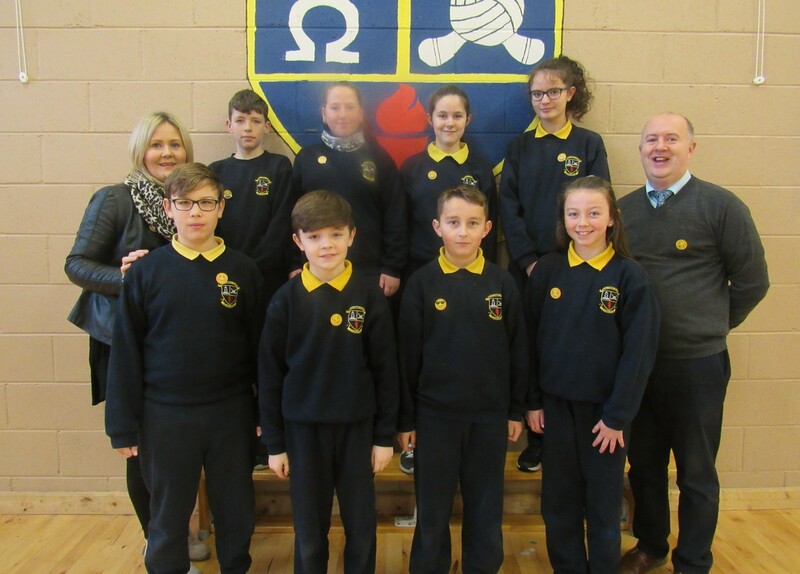 Battle of the Brains Quiz Competition: the first school wide quiz competition of the year came to a conclusion last week. After 4 weeks of intensive questioning we can confirm our two new champs for 2017. 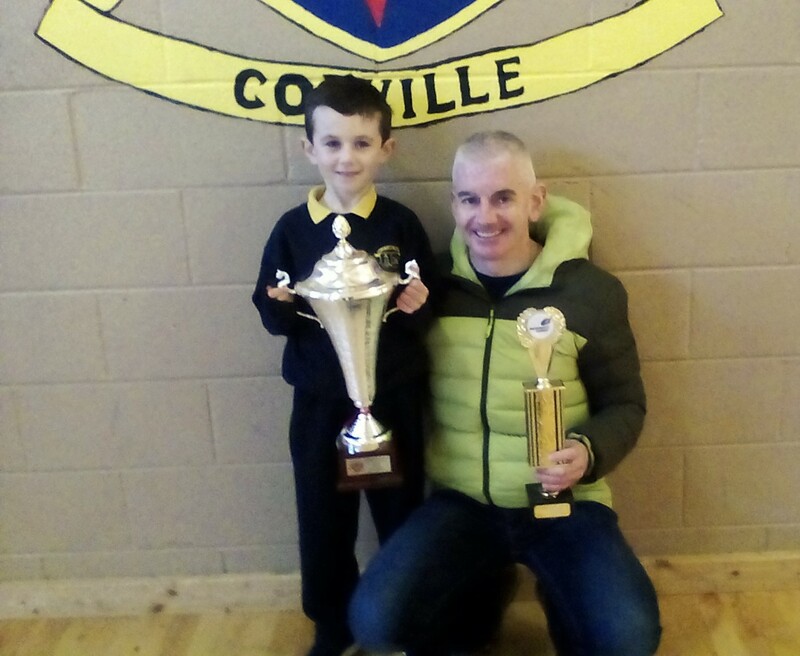 In the U/13 section Ryan Whelan came out on top while in the U/11 section Senan Whelan won for the 2nd year in a row. Well done to both boys and to all the girls and boys that made it on to the quiz 16 member quiz squad. 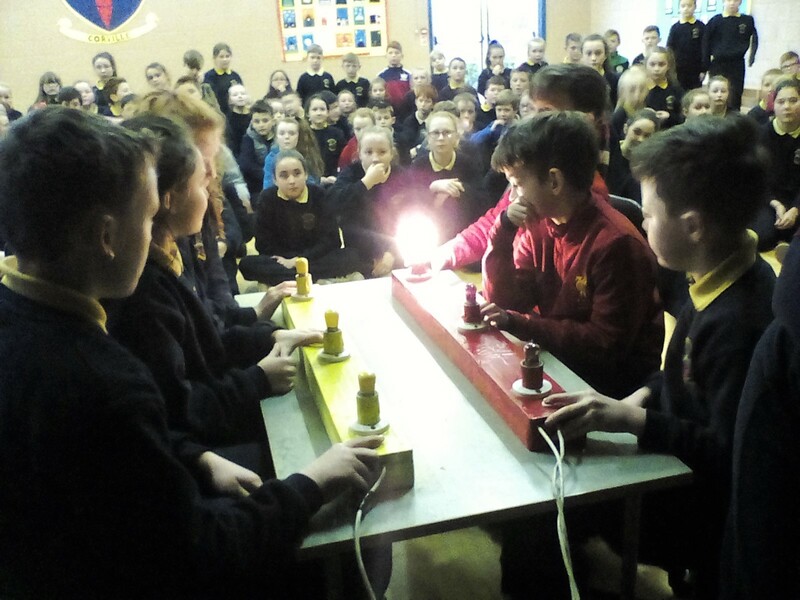 There were 62 entrants in the Battle of the Brains competition all together so to come out on top of that pile of brains is a great achievement. quiz squad: will meet for practice every Tuesday from 3:00 – 4:00 in Mr. Scully’s room. 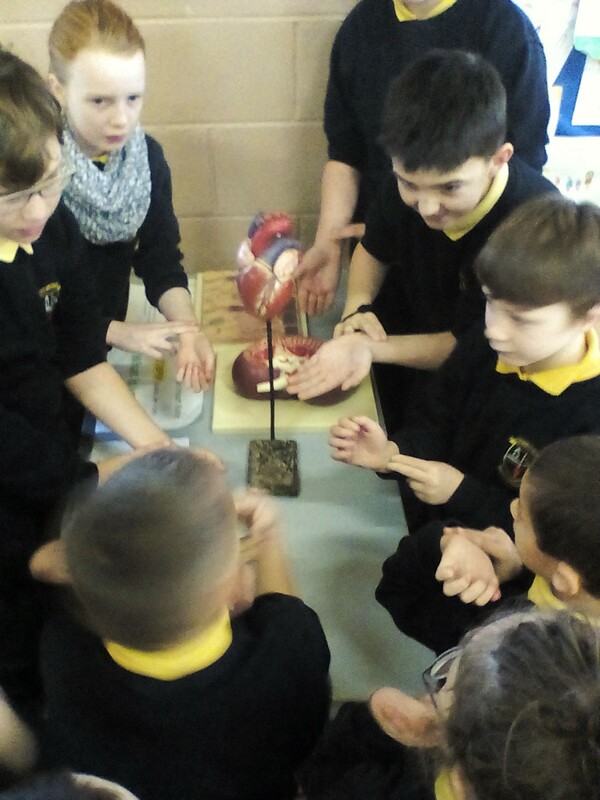 Erasmus: the school welcomed visitors from Portugal to the school during last week. They are over as part of our Erasmus programme of events. 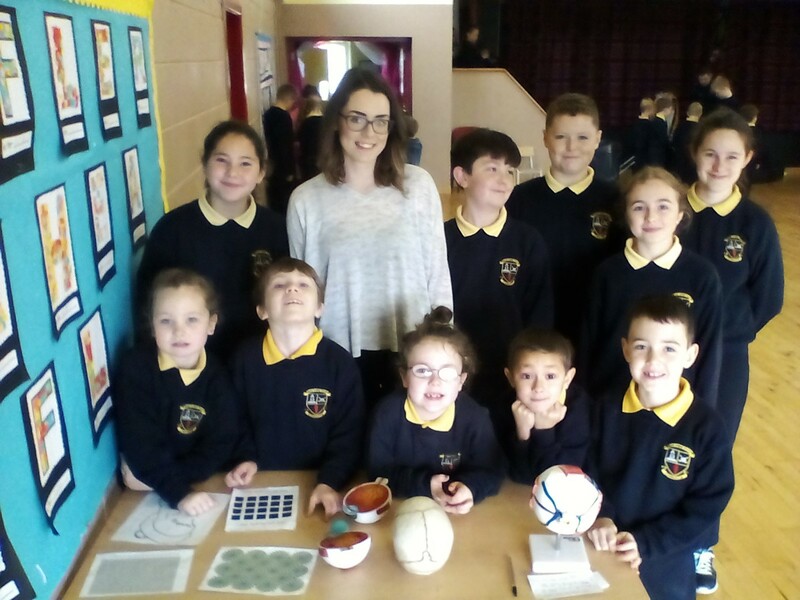 The Portugese students visited our classrooms and were questioned by their Corville peers. It was very interesting to hear how students from other parts of Europe talk about their school experiences. As part of the Erasmus programme, 5 Corville students will soon be packing their bags and heading over to Bulgaria for the week. This is a great opportunity for those students and they are all understandably very excited about it. No doubt they will take plenty of photos and keep us all updated on what they get up to. Gardening Competition: the students were challenged with creating a design for the green area at the front of the school. We had a huge entry with lots of excellent ideas on display. Ms. Murphy had a very hard time picking the winner but a well deserved winner it was as you can see from the photo below. This garden design came with the title “Teachers plant the seeds of knowledge that grow forever”. 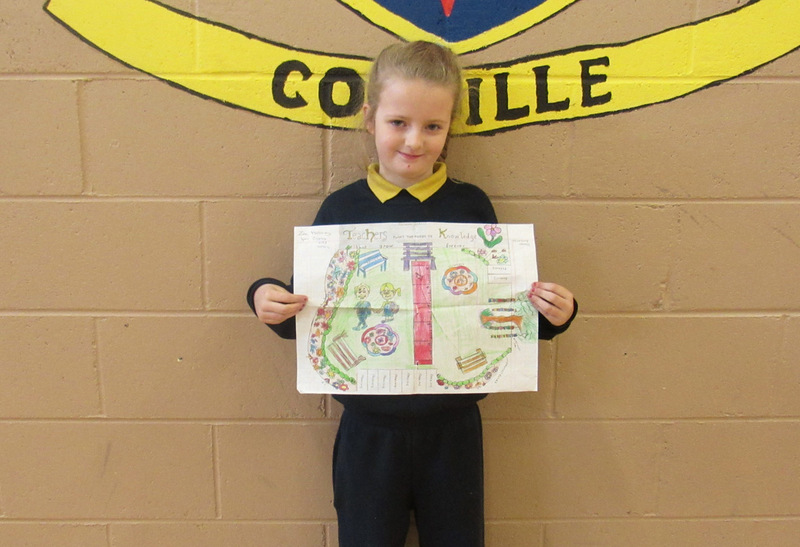 Excellent work from Zoe Moloney in 4th class! 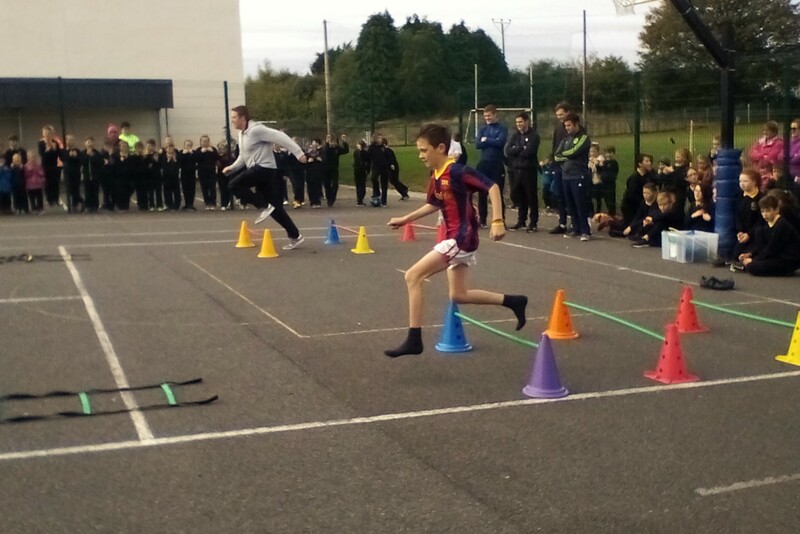 Active Corville: the school were back in sporting action over the last few weeks. 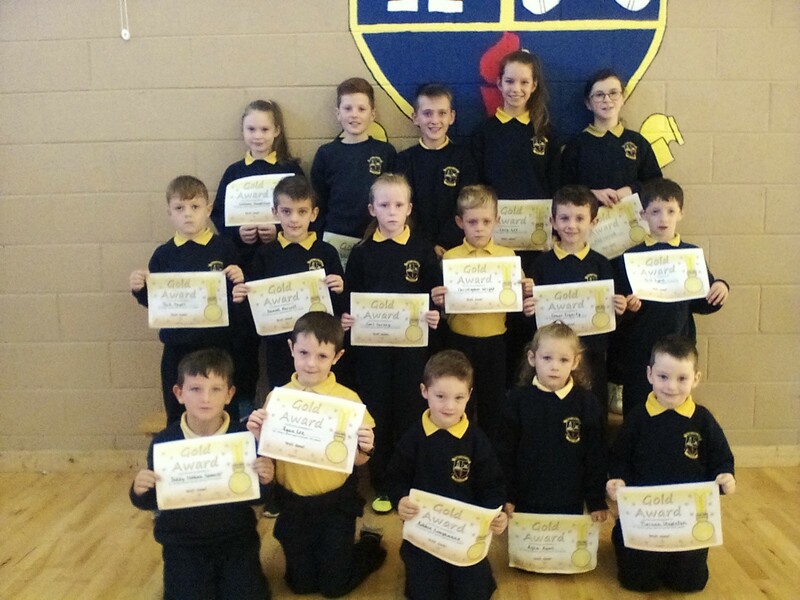 We also crowned our gold award active students for last month…. 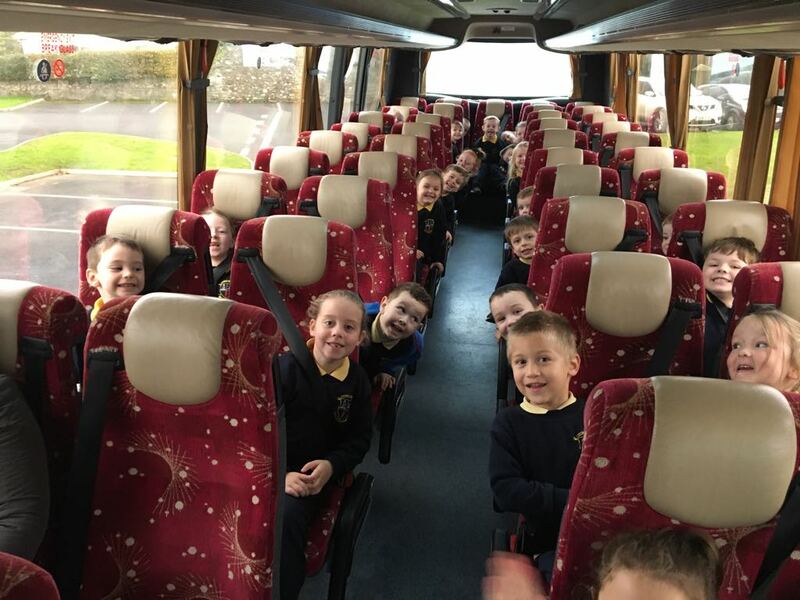 Cross Country: Students from 3rd – 6th class made the trip over to Thurles for these races. 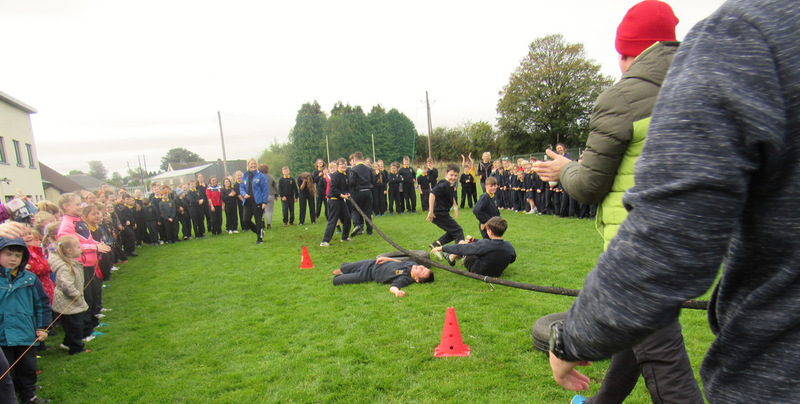 Cross country running sure isn’t easy so it was great to see a large group from the school being brave and tackling this tough event. Everyone gave their all and we are super proud of their efforts. 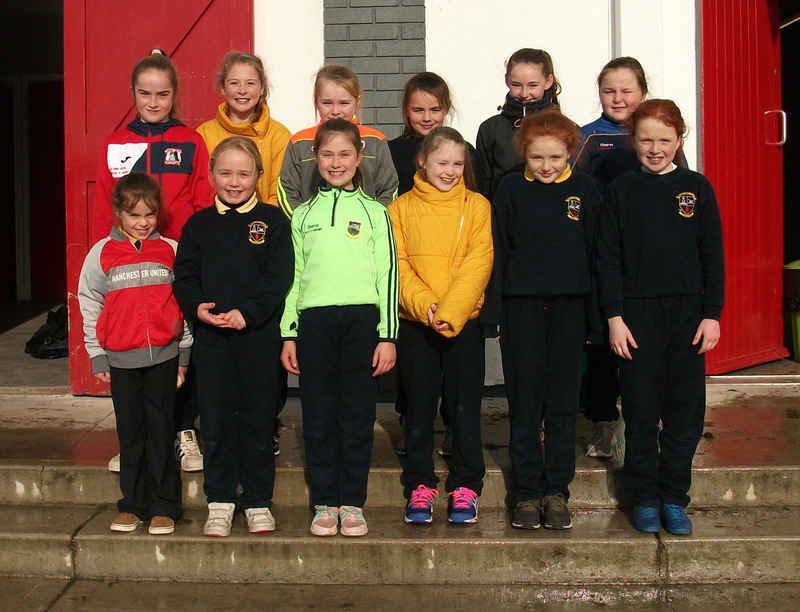 Star performer on the day was Ceola Bergin who won gold in her 5th/6th class race. 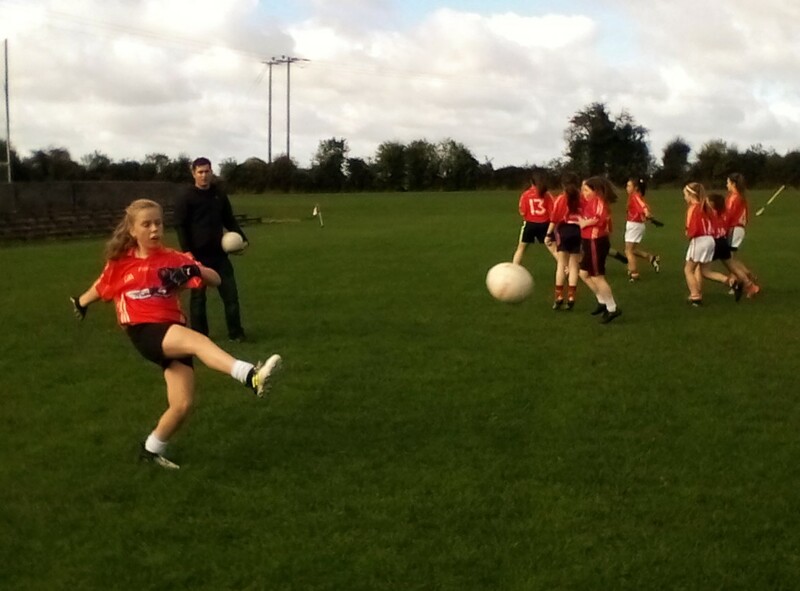 Football: Also in action were our U/13 Girl’s Football team. 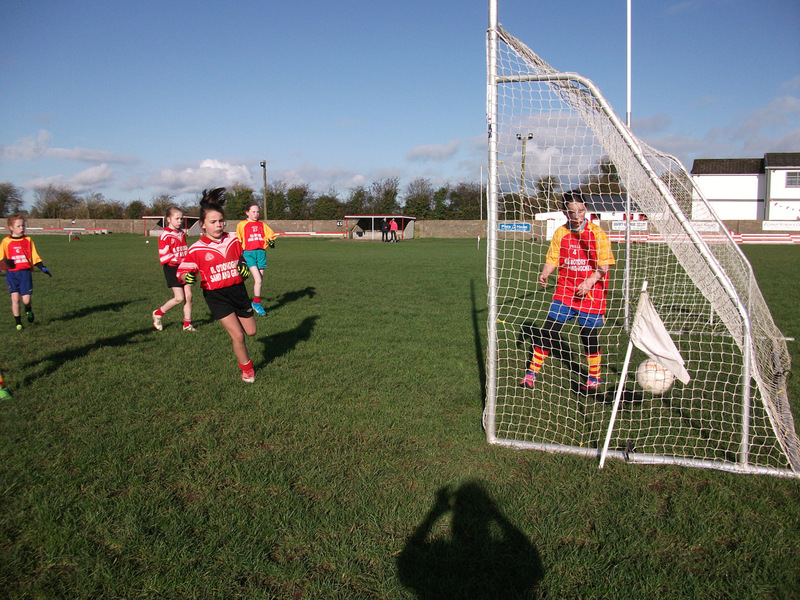 They took part in the local heats of the Tipp Champs. The girls won 1 match and lost 1 match but that lost match saw them exit the tournament. Having got to the final last year, the girl’s were bitterly disappointed. 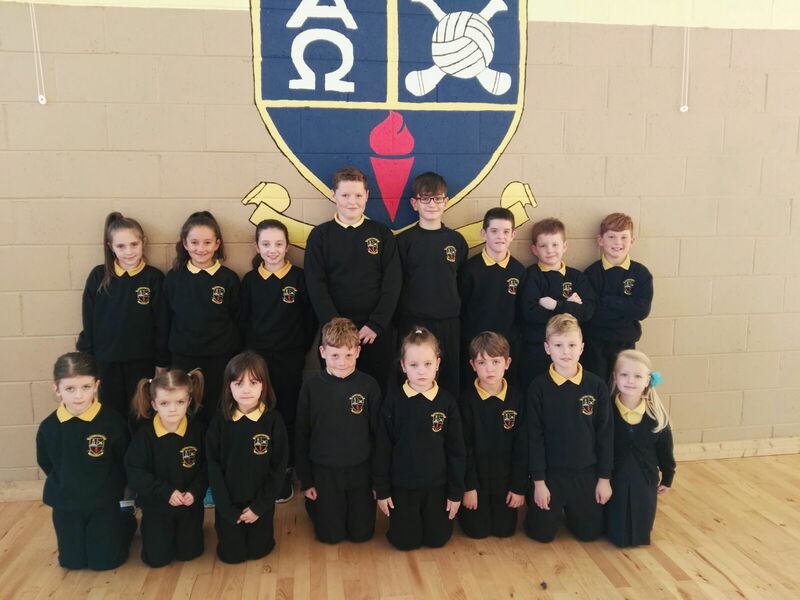 They can take heart from the fact that they were beaten by a very good side in Moyglass who we are sure will go a long way in the tournament and we wish them all the best. 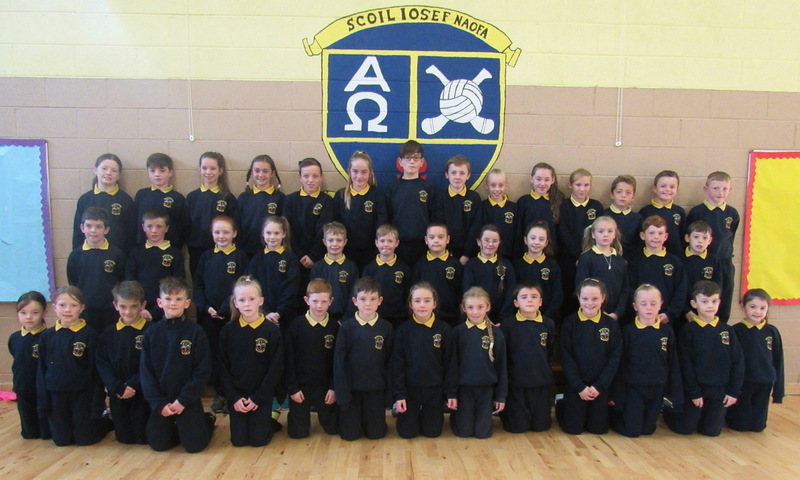 Soccer: the school sent over a girls and boys team to take part in the FAI 3rd/4th Futsal blitz. Both our teams were very strong and performed extremely well throughout the competition. 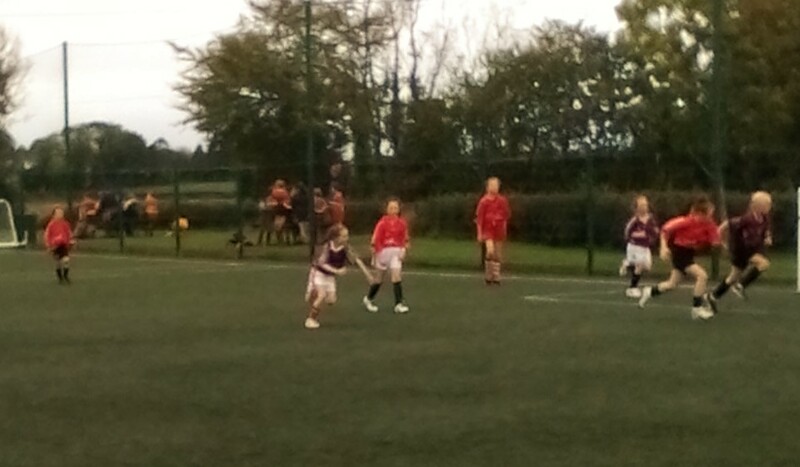 At this age level it’s all about taking part and enjoying the sport and our sides certainly did that. 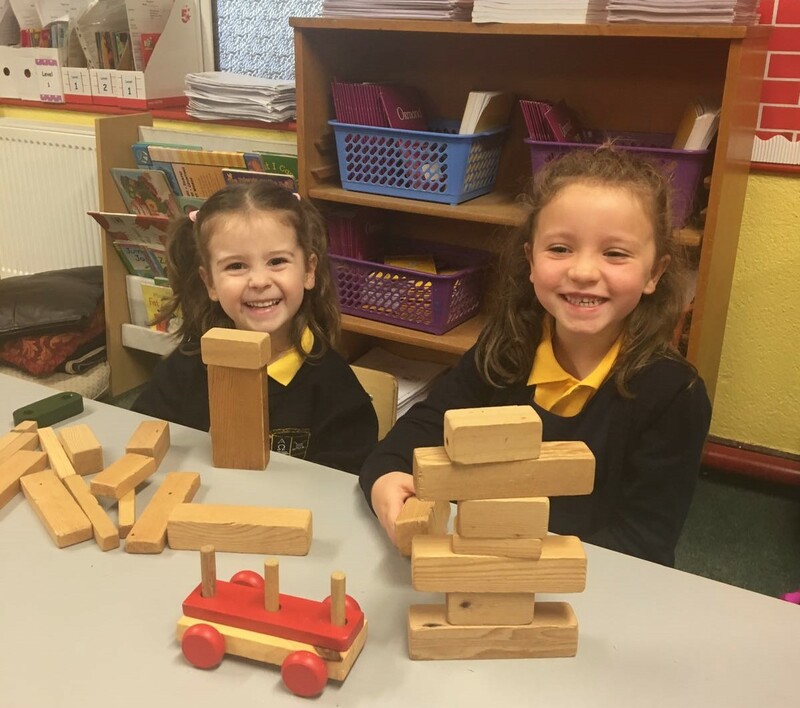 It certainly looks like we have a few stars of the future in the school! 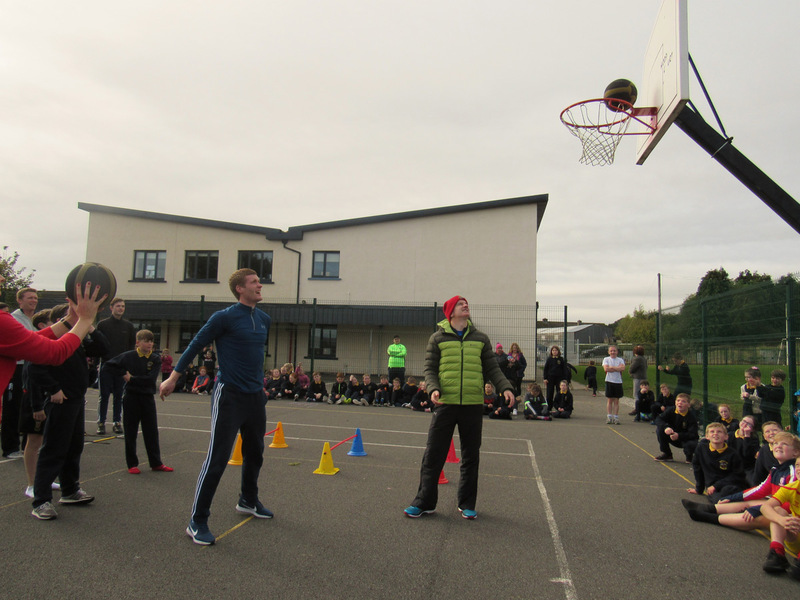 Teachers Vs 6th Class: on Friday the school held a teacher vs 6th class student challenge. 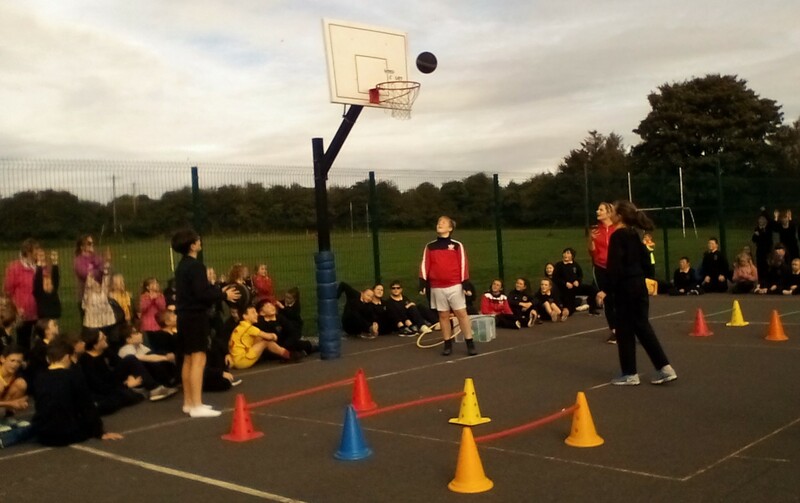 There were 4 events – obstacle course, penalty shoot-out, tug of war and basketball. 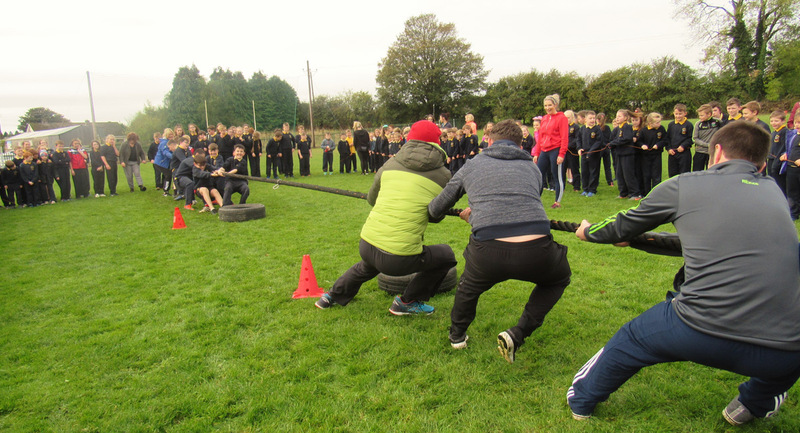 The contest was keenly contested with the boys taking on the male teachers and the girls taking on the female teachers. We reckon it ended up in a draw at the end but when you are having so much fun, who cares about the result?! 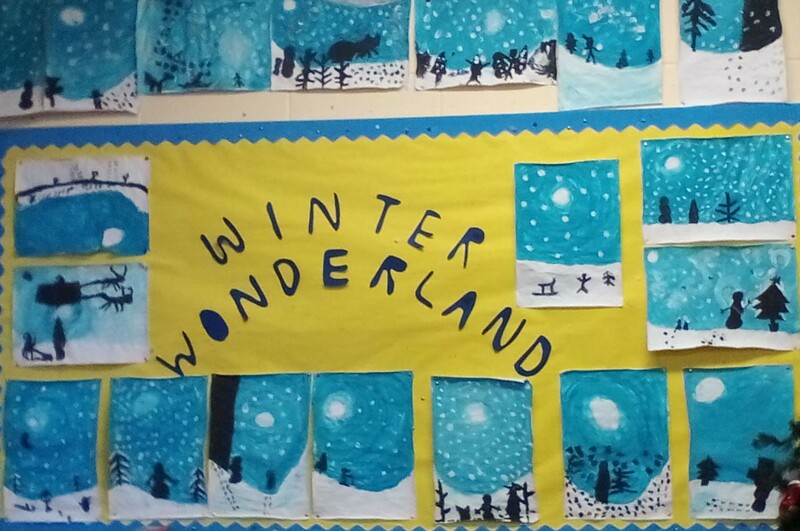 Other Art Projects: Below is a small sample of some of the great art work on display throughout the school. 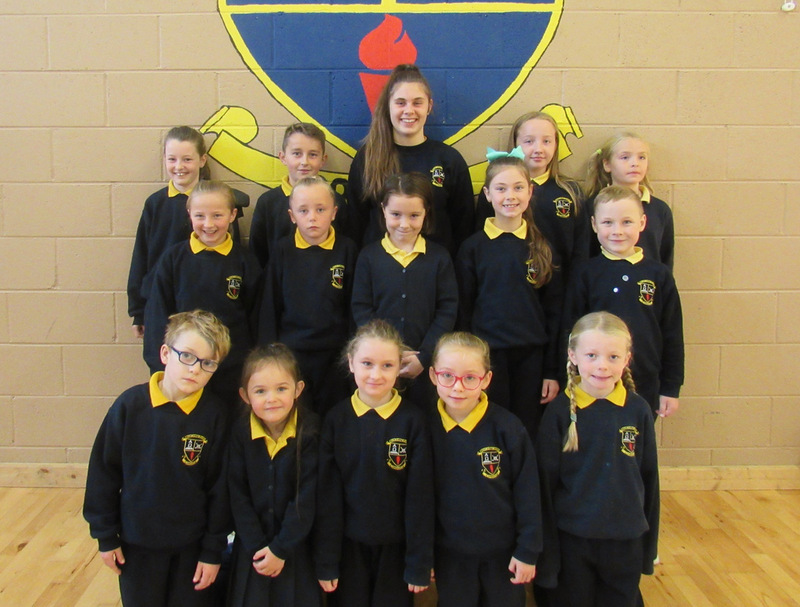 School Choir: it has been a hectic start to the year for the school choir as they were working flat out on a new audition tape for the Late Late Toy Show. The choir are performing Jessie J’s song ‘Price Tag’. 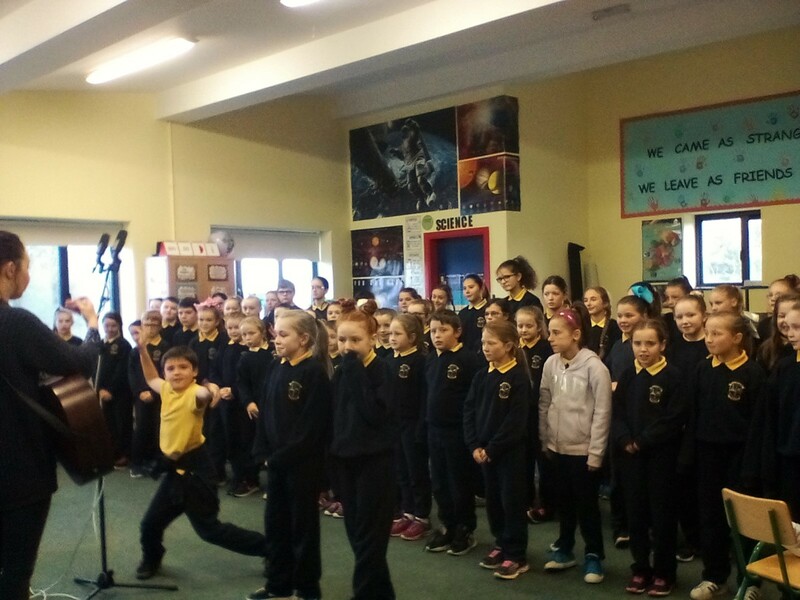 A live recording of the choir performing in the hall was made during the week and the final DVD was sent up to RTE to be judged. Fingers crossed our entry is good enough to qualify the school for the live auditions later in the year. 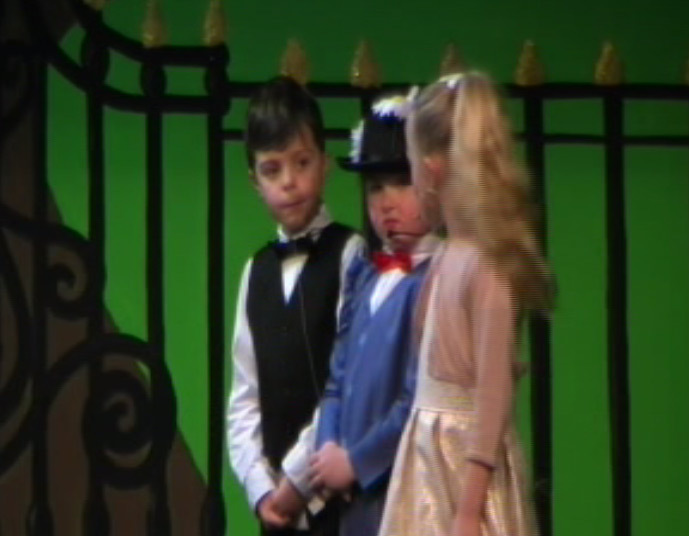 Below is a snippet from the performance (we will have the full high quality video on our Corville Facebook page soon). I think you will agree that it is a fantastic effort from everyone involved. Big Sporting Year: it is going to be hard to replicate the success of last year on the sporting front but we are going to try our best to do so. 10 county finals were reached with 5 victories coming from those finals. 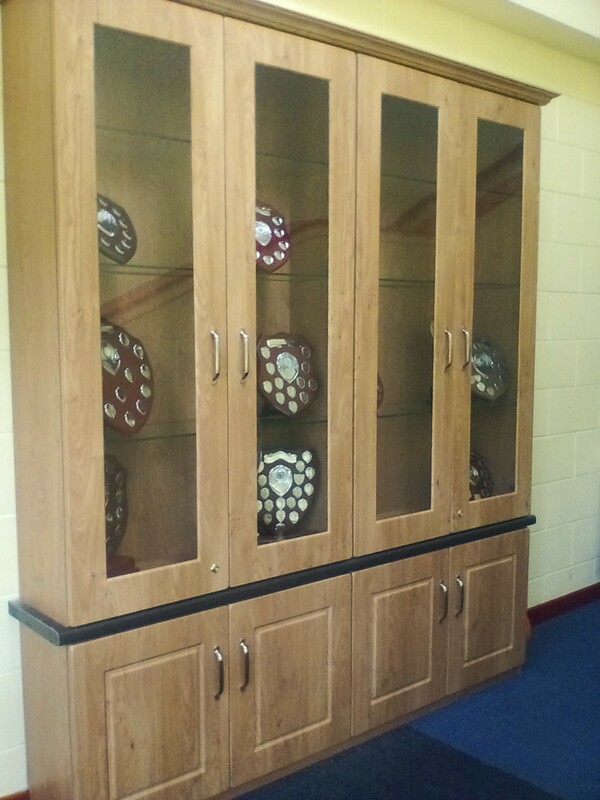 That has helped us with filling up this brand new trophy cabinet, located in what we are now calling our Hall of Fame! There is still plenty of space in there for more cups so we wish all the best to our sporting teams this year. Students of the Week: congrats to our first 3 batches of students of the Week for the new academic year. 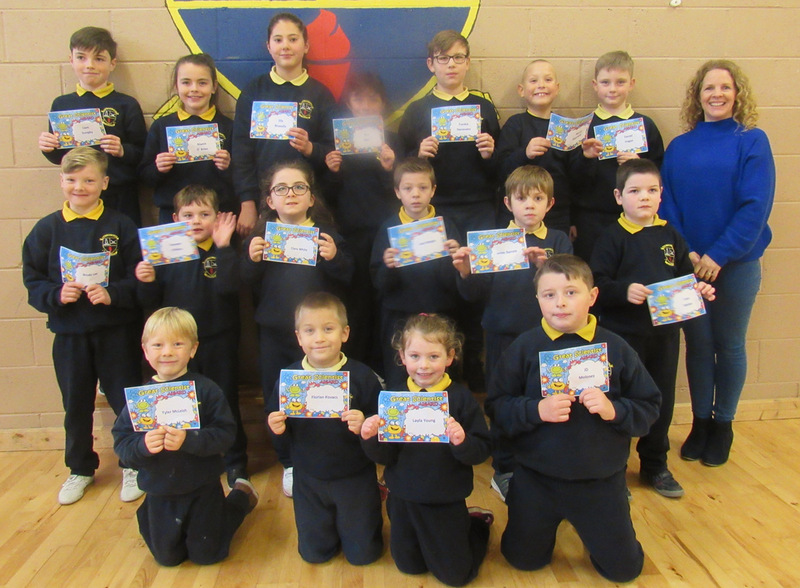 Each of these students has displayed great manners in class and shown exceptional ability in their work. 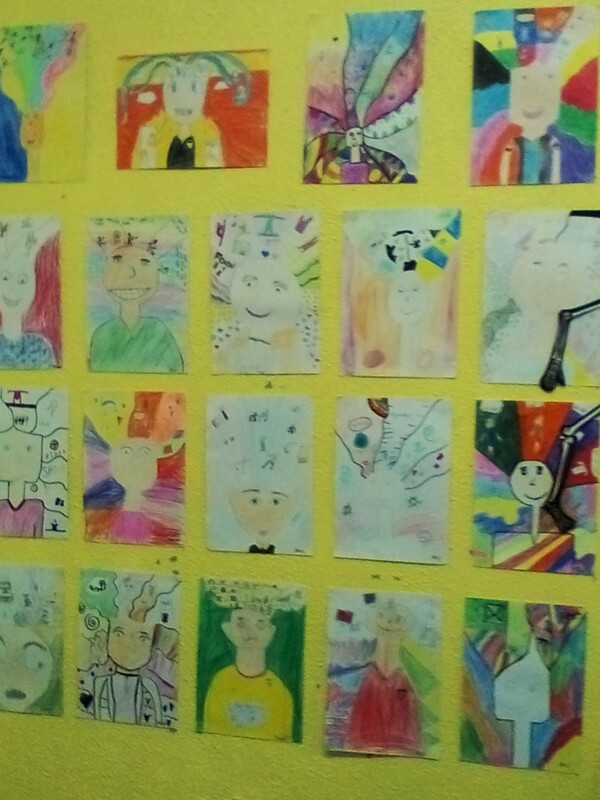 Looking for Inspiration: at Corville we challenge our students to dream big and work hard to achieve those dreams. 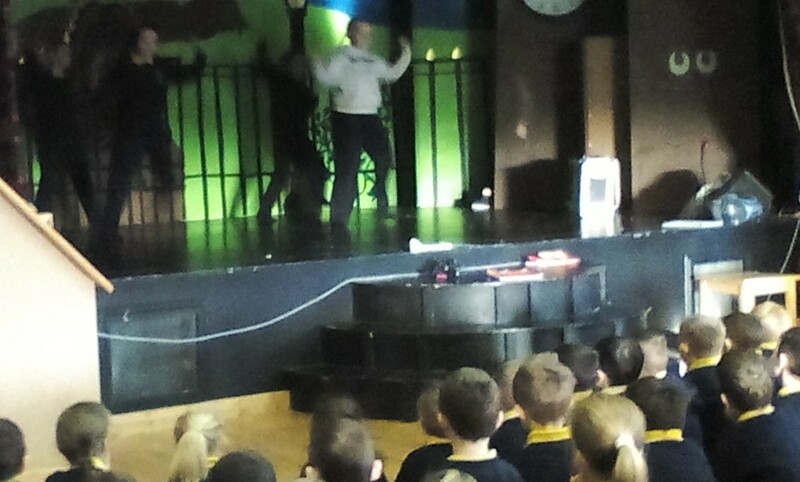 Assembly Performances: this week it was the turn of our two 5th classes to perform on stage for the rest of the school. They gave us a great rendition of Imagine Dragons ‘It’s Time’. Sunshine and big smiles were in abundant supply on our first day back in school last Thursday. 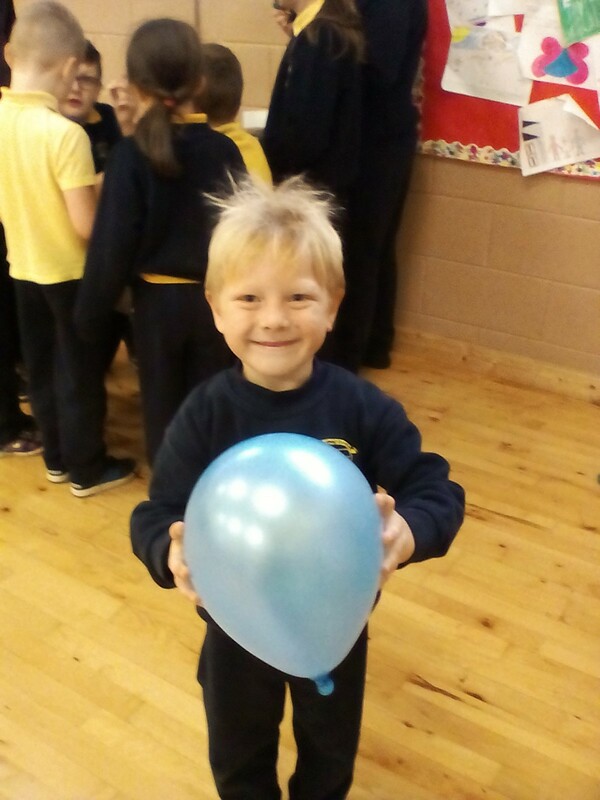 There was a great buzz around the school as our students met their friends once again. They got to see their new rooms and they met their new teachers for the year. It’s amazing how quickly everyone gets back into the swing of things and before long we were all back hard at work as if we had never been away! 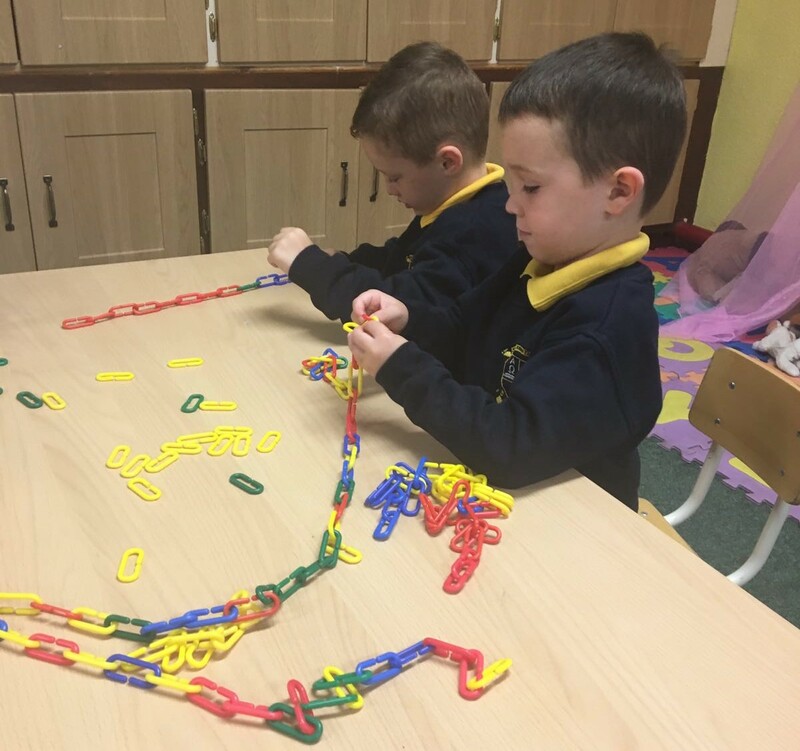 New Faces: While it is always sad to lose our 6th class students from the school, it is also fantastic to see our new Junior Infant classes settling in so well into the school. 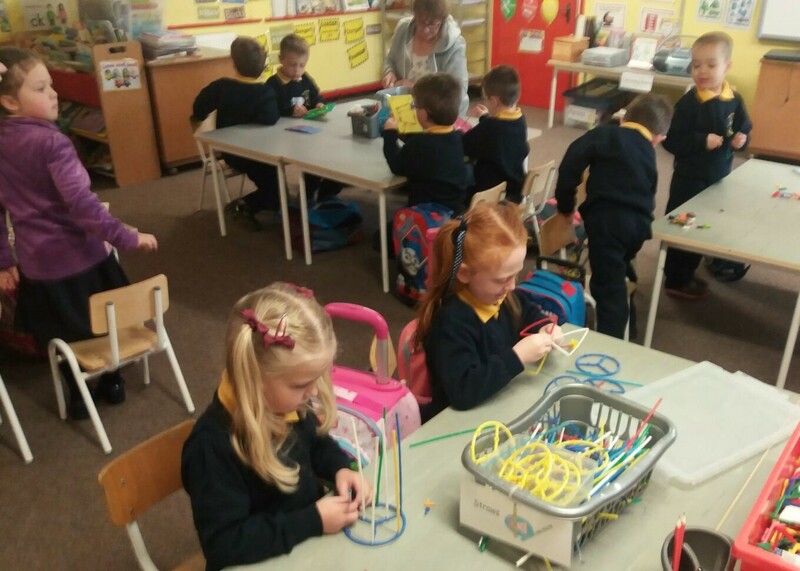 Both Ms. McMahon and Ms. O’Connell have commented on how brave and well behaved the classes are. 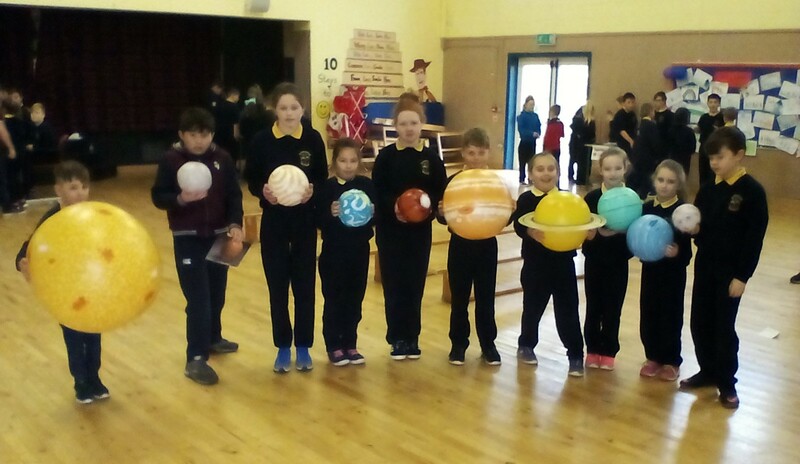 They were super mannerly at their first ever school assembly where 6th class kicked off the on-stage performances with a rousing performance of Shakira’s song ‘Try Everything’. 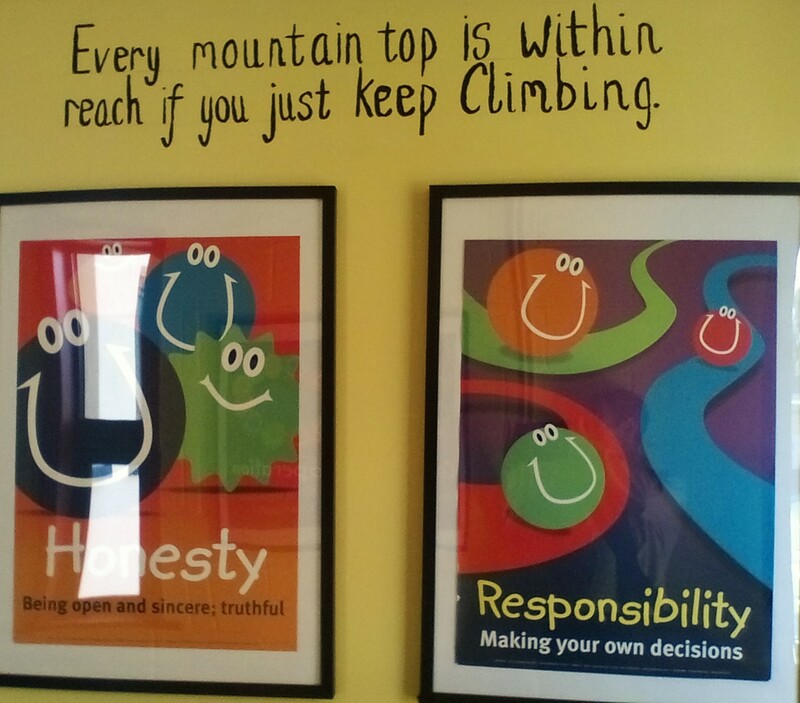 The lyrics in this song are very apt for what we expect from our 6th class students this year. 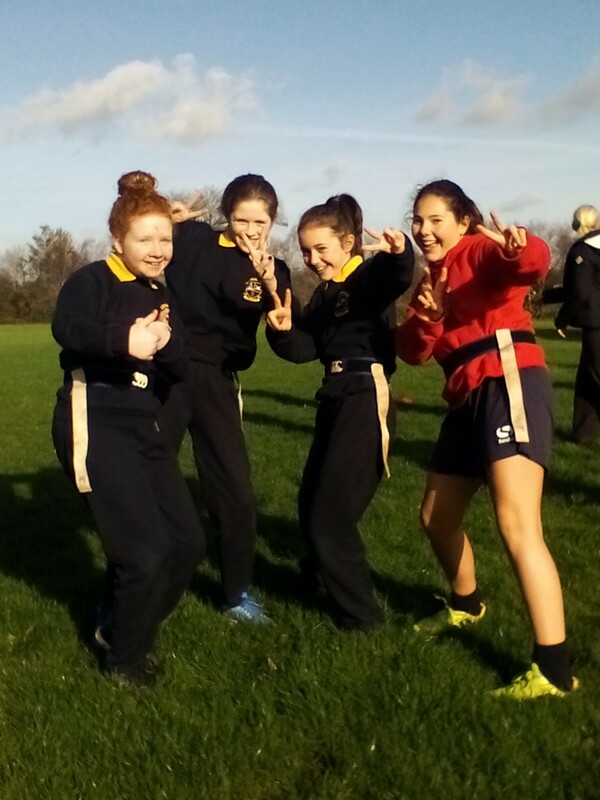 Cross Country Running – Wednesday, Sept 27th in Thurles. 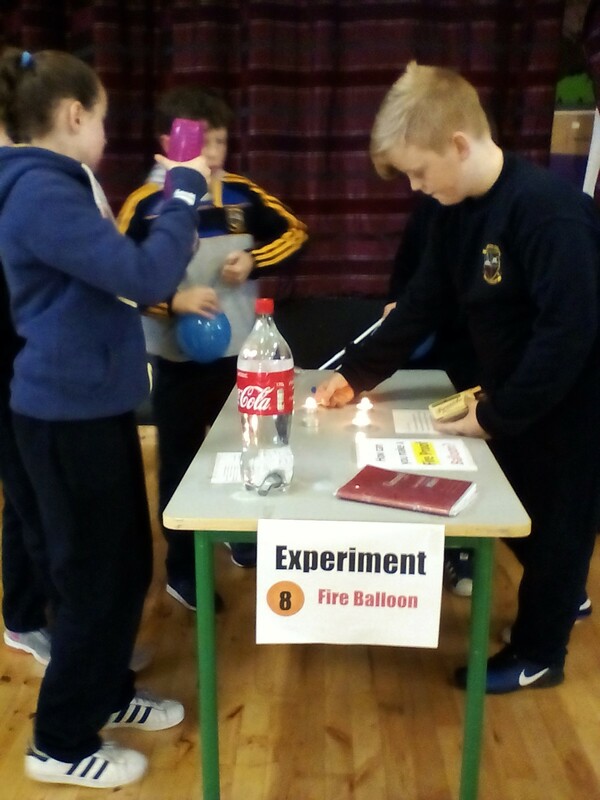 Students from 3rd to 6th class can take part in this. Training begins this week on Friday at lunch in the field. 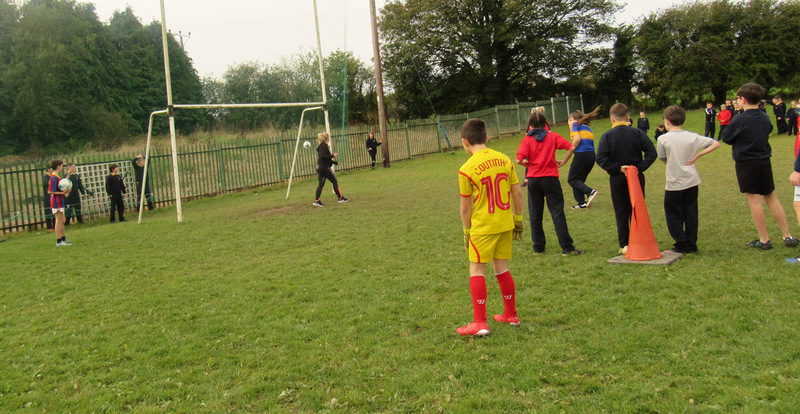 Gaelic Football – the Boys and Girls football tournaments will take place in Oct/Nov. Training starts this week for the boys on Tuesday and Thursdays after school (3:00 – 4:00). 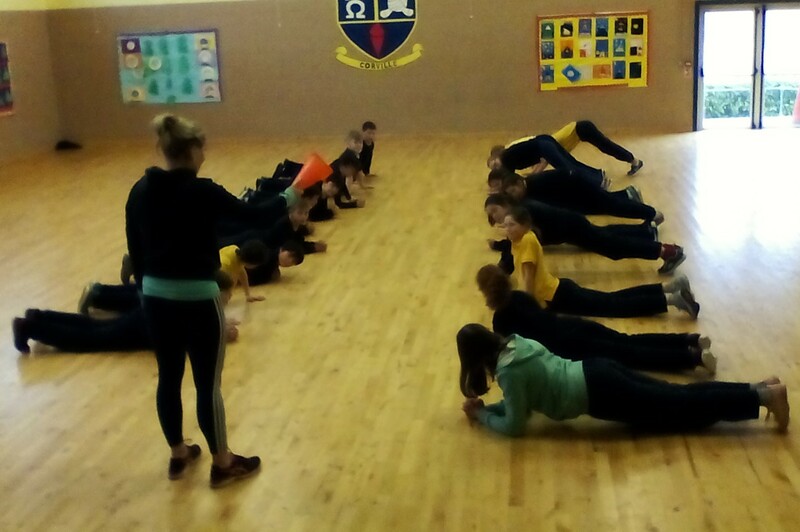 Training kicks off for the girls next week on Tuesdays after school. 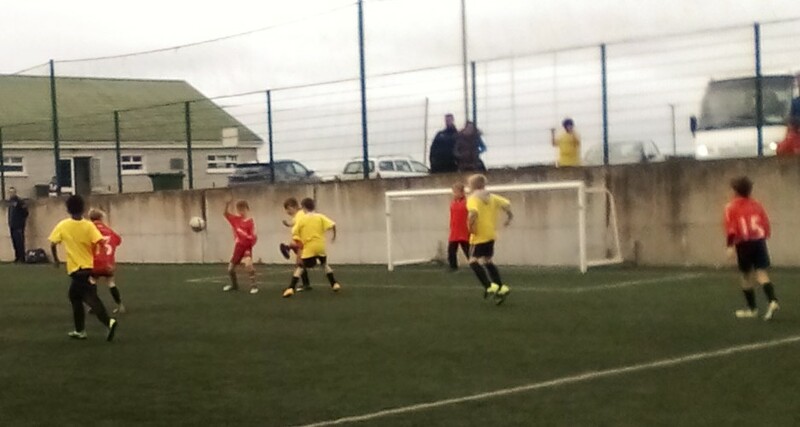 Soccer Training: there is a 3rd / 4th class Futsal tournament on September 28th. 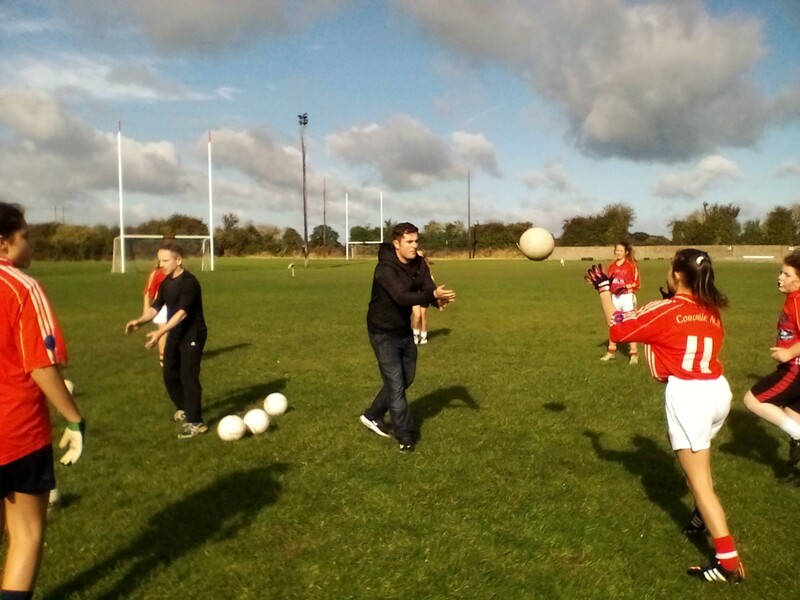 Training for all boys and girls from 4th to 6th class takes place on Monday’s after school (3:00 – 4:00), starting next week. Quiz: For the Brainiacs in the school, the school quiz team will be starting training next week. As usual the quiz year will start with our Battle of the Brains competition. 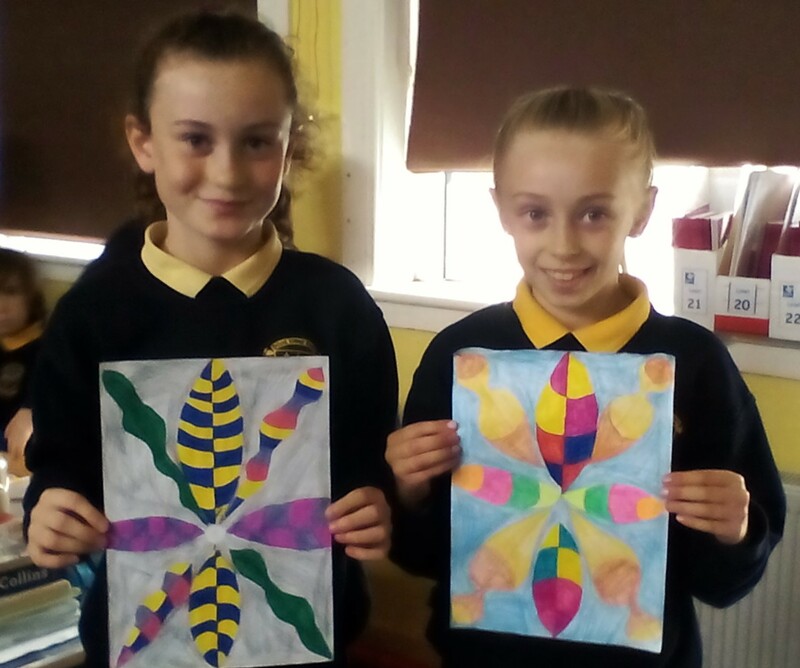 This competition is open to all students from 4th to 6th class. If you want to make the quiz panel then make sure to enter this competition. Our quiz teams are very close to making a break through, having come 2nd & 3rd in the U/11 and U/13 competitions for two years in a row. Fingers crossed this can be our year! School Choir: there was a great response from the students when it came to signing up for the choir this year. The students saw the great success the choir had last year and they want to be part of it. This is good news for the choir as we have some excellent singers in the school. Choir practice will take place on Tuesdays after school. 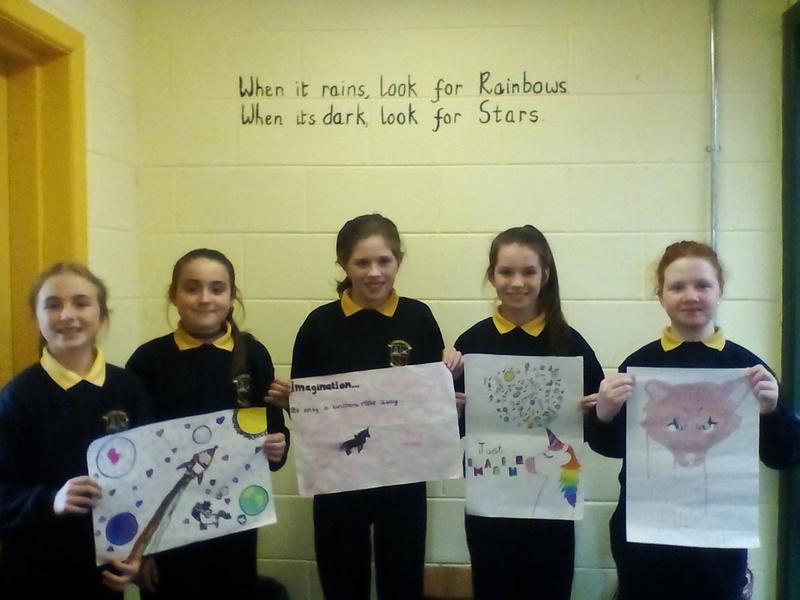 6th Class Blog: the students in 6th class have started their own blog. 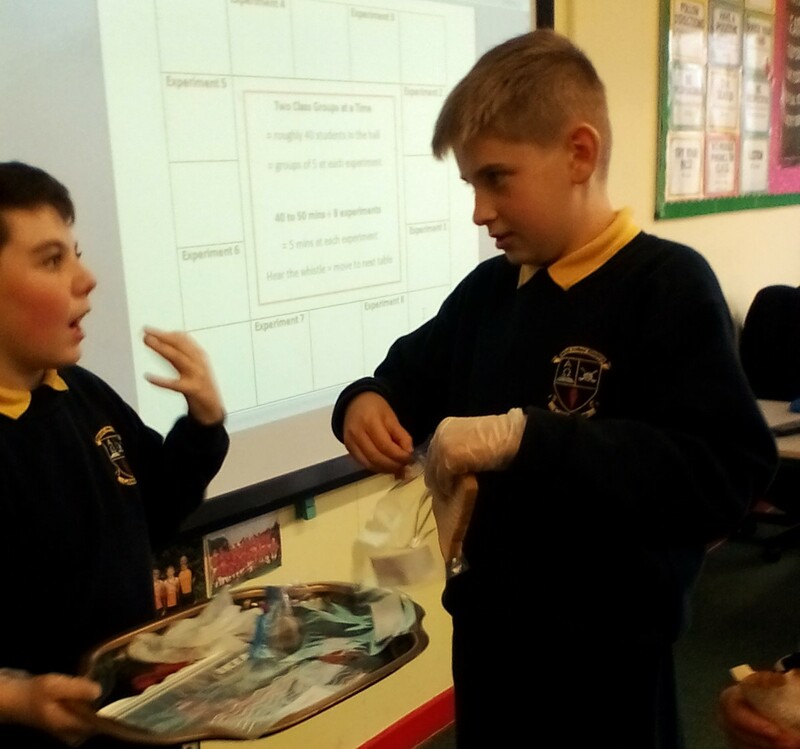 Each week a new blogger and photographer will you bring you all the news from the classroom. All the students will get a chance to take part but first up are Lauren and Leigh who hope to update the blog by the end of the week. 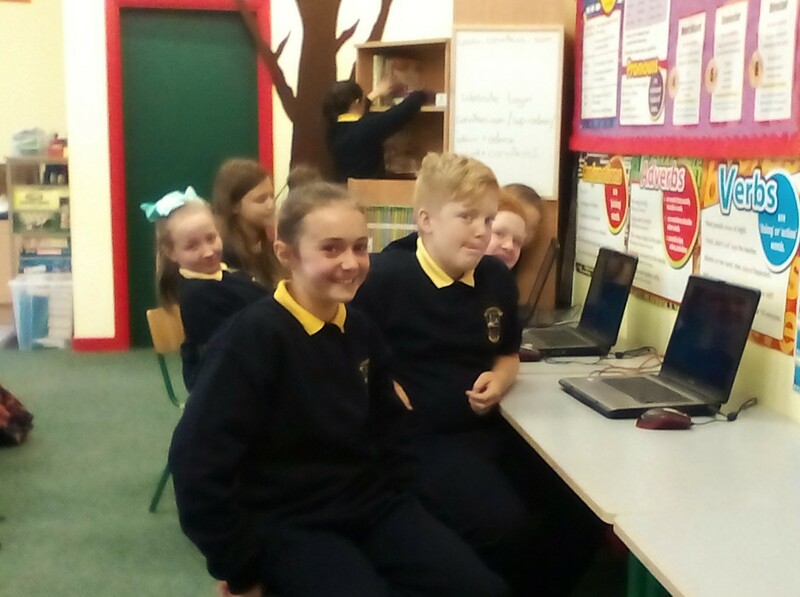 Below you can see the students learning how to update our website in Mr. Scully’s computer corner. Website updating and photo capturing and manipulation are great skills that the students will learn throughout the year.